Today the entire Team of the TREES CONNECT tour 2016 gathered at the Brandenburg Gate. 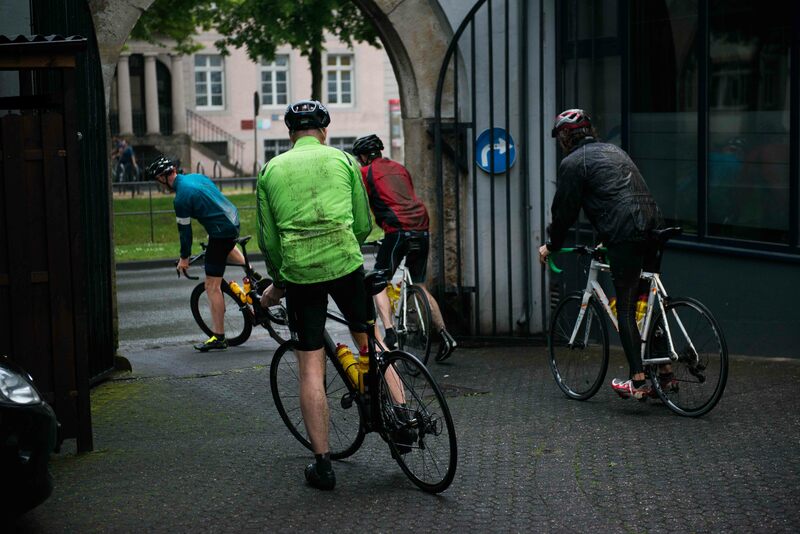 We set out for our first 150 Kilometers to Oranienbaum with 23 riders, trying to escape the red lights of Berlin. 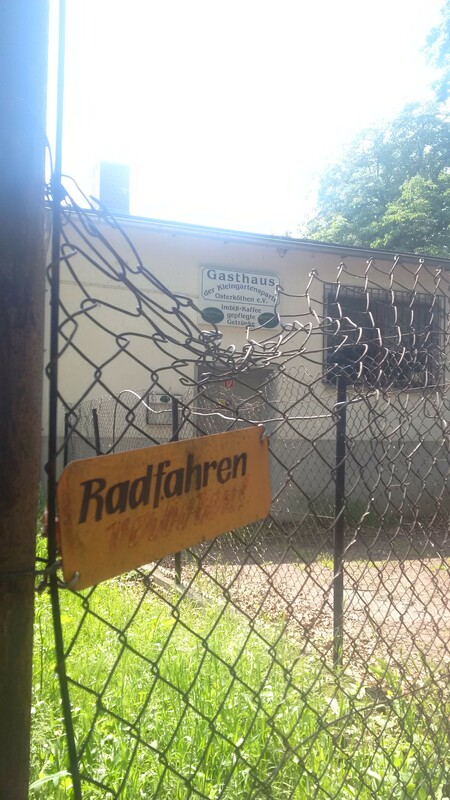 We passed Potsdam, Ferch, Beelitz Heilstätten and headed towards Bad Belitz. A warm welcome from the city oficials in Bad Belitz, seeing the Resista Elms planted next to the R1, a break with world class pancakes from Karsten Nieman (shop4cross) and sunny weather guaranteed cheerful spirits. One of the riders earned the nickname „King of Click“ after his third crash whilst comeing to a halt.– The fact that it was his first time ever useing click pedals, might not have worked in his favor. Further down the road the MDR (TV) accompanied us to Oranienbaum, where the last Resista Elms of stage one were planted. All together we checked into the Hotel and our day ended with dinner, after a fun 150 kilometer ride from Berlin to Oranienbaum. After a hearty breakfast the TREES CONNECT team got things moving again. 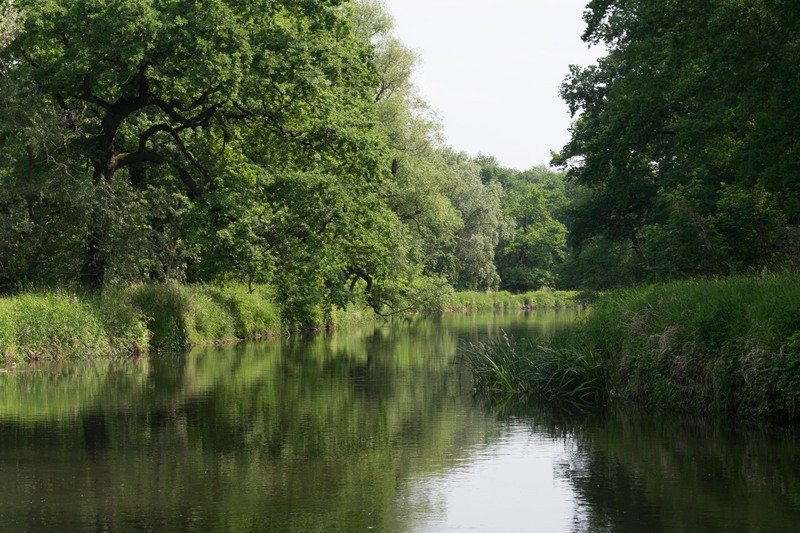 The group took a vote and decided against taking a shortcut through the biosphere reserve on the Middle Elbe: the route they took instead led them past the Oranienbaum Palace and rewarded them with a varying landscape of lush natural meadowlands. Contrary to the weather forecast the day remained warm and sunny. 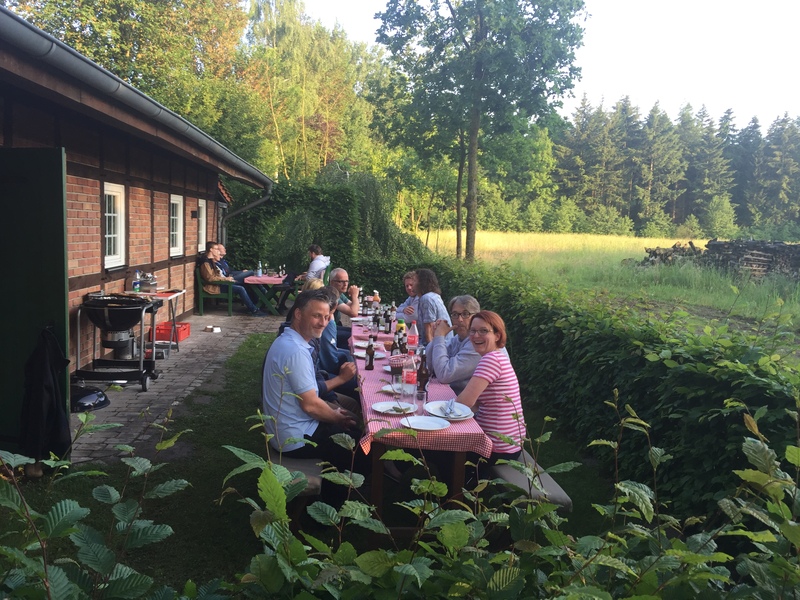 In Koethen (Anhalt) the team took a break at the Osterkoethen Garden Colony Guesthouse. 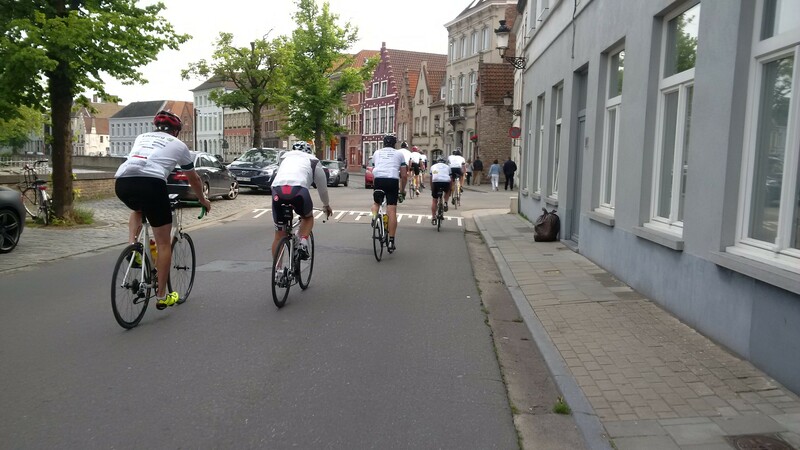 It continued in the same varied way, the road switching indiscriminately between perfectly asphalted roads and cobblestones, just like the spring classics of the pro riders. Only the most surprising obstacles convinced the group to dismount. 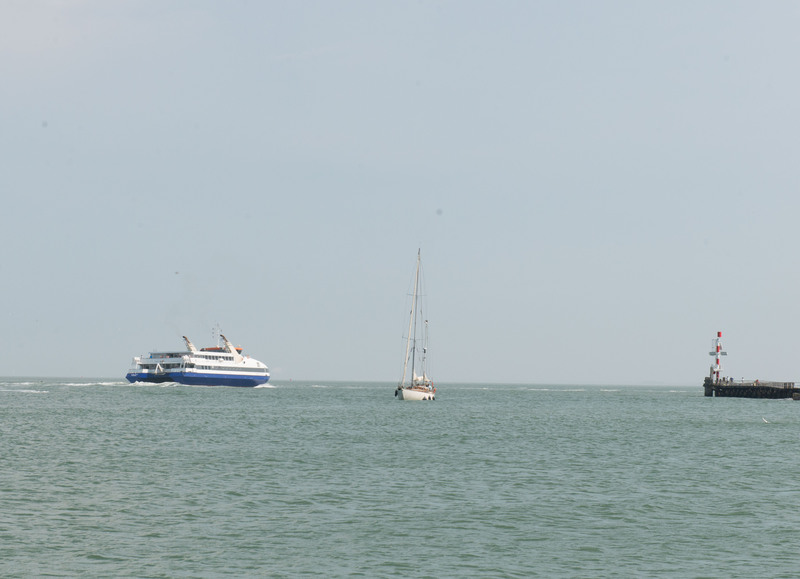 After 130 kilometres we said goodbye to three loyal companions. The group that remained could look forward to a pleasant revitalization in the idyllically located Schlosshotel. After a quick stopover, day three meant saying goodbye to Quedlinburg and its extremely picturesque old city, as well as the outstanding abbey church. Not to forget the renovations being enacted on the castle hill – extremely interesting, if only to the eye of a landscape planner. The west called, but before Bad Harzburg – our first stop in Niedersachen – could be reached, there was some film work with the MDR to be done. With their wide-ranging local knowledge, the cameras were always one step ahead of the bicyclists; and the resulting masterpiece, as well as the clips which were filmed on the first tour/filming day, should now be in the MDR Mediatheque for all to enjoy. 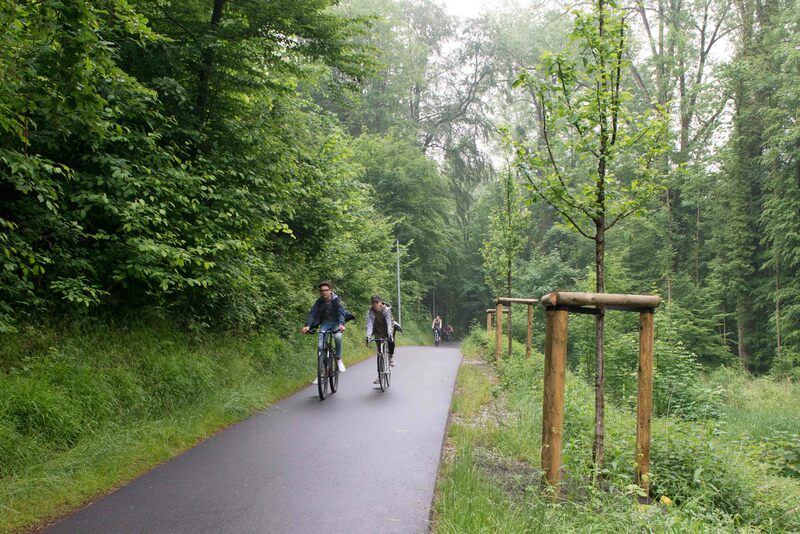 The attention of the media reached its high point with the three Resista elms which had been provided by Lorberg and planted by the town of Wernigerode. 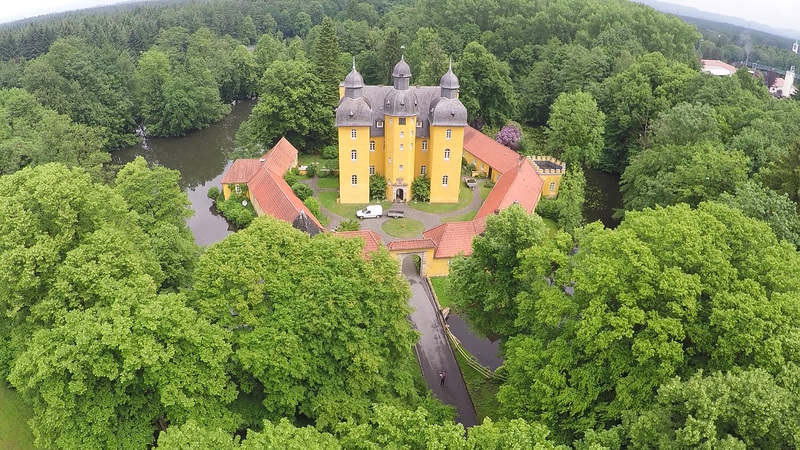 Alongside MDR, the public television flagship, the local station and the press representative of Wernigerode were also there to witness and preserve for posterity the watering of the trees by Inga Volkmann, responsible for the upkeep of the green spaces of the area, junior CEO Daniel Lorberg and the tour leader Johannes Grothaus. After a few alarming seconds at an underground crossing in Wernigerode, where the local fire department decided to tout the riders with their entire fleet of vehicles, with all sirens blaring, the route left the tarred roadway behind. 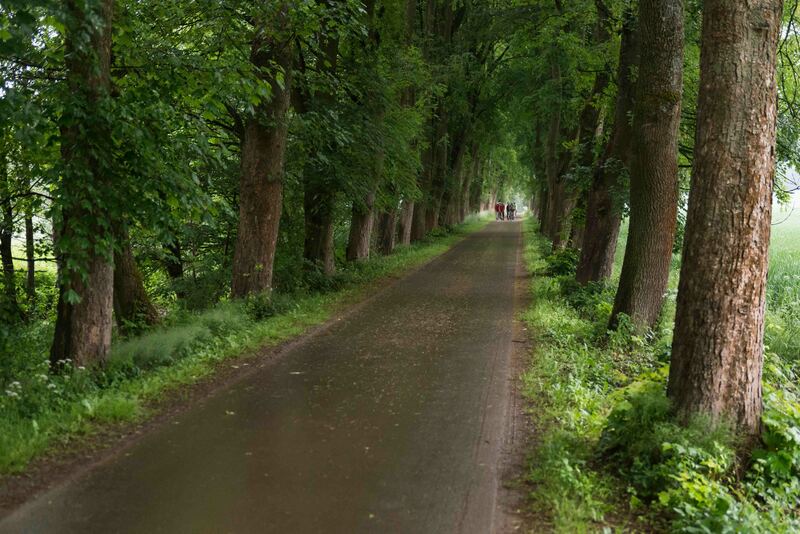 A large part of the rest of this section of the tour consisted of forest paths leading through the greenest parts of the Harz, with all the gradients and scents of wild garlic that you would expect. 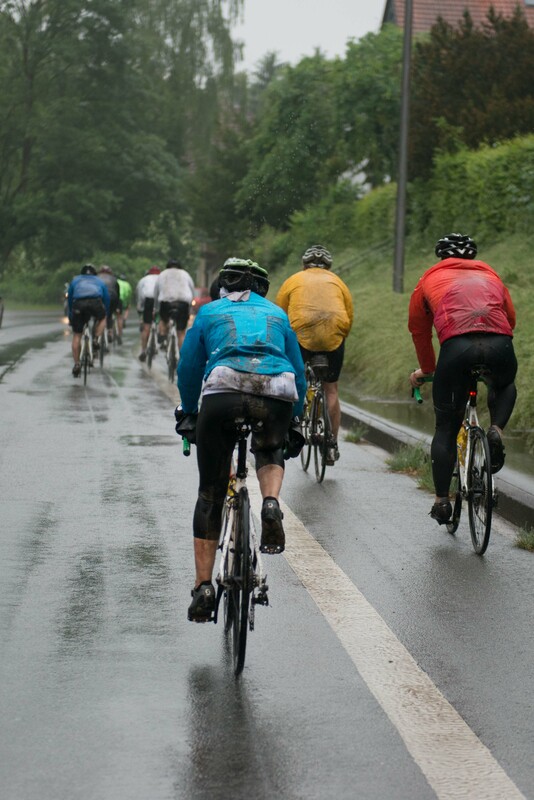 All this, before Bad Harzburg could be reached: and with the result that some of the riders were tempted to carry on in the direction of Brocken. 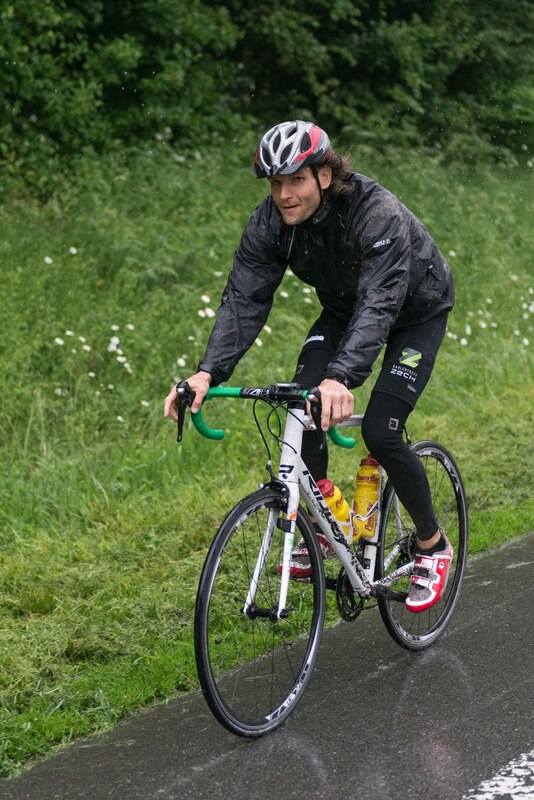 The fourth day of the tour was tough for the participants: not because it was the first time that it had really rained; no, it was much more that yet another perfect cycling day had left no wish unfulfilled. After four days that competed with each other to provide the most vivid array of impressions, there’s now not a single person in the Lorberg peloton who could truthfully point to one day as being better than the others. Today saw a perpetuation of the lush greenness that we’d become accustomed to during the previous stage. 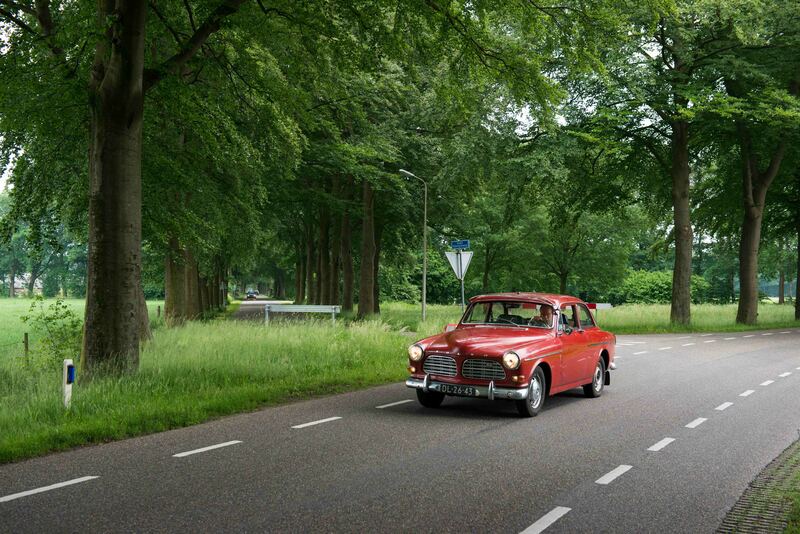 Although this was now supplemented on the road from Bad Harzburg to Holzminden with a constant, pleasant switch between up and down gradients, just right for the ability – and the will – of the ever more tightly knit group. Impressive, how in so few days a riding order had established itself – even if the odd one surged ahead every now and then. 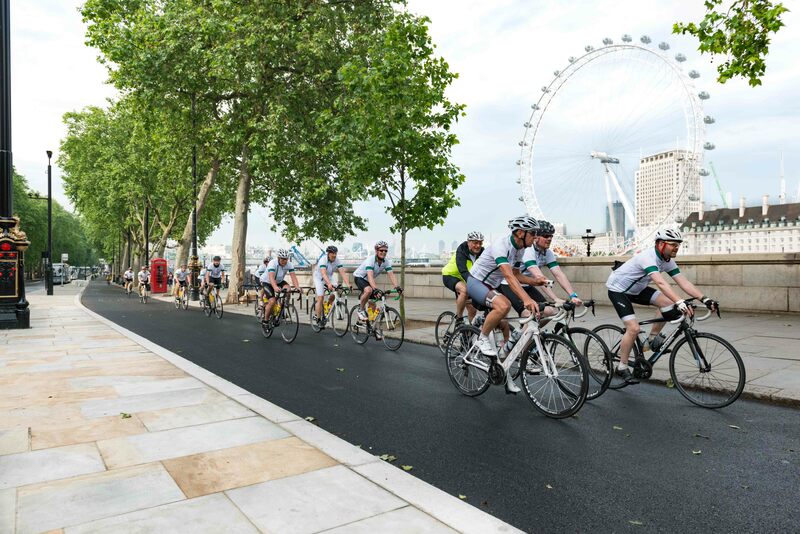 But then these are cyclists after all. And on the fourth day too we came to lay eyes on a number of Resista elms running along the edges of the road. Franziska Schwarz, mayor of Bad Gandersheim, greeted us while standing within a nascent grove of elms which lay at the entrance to the town. 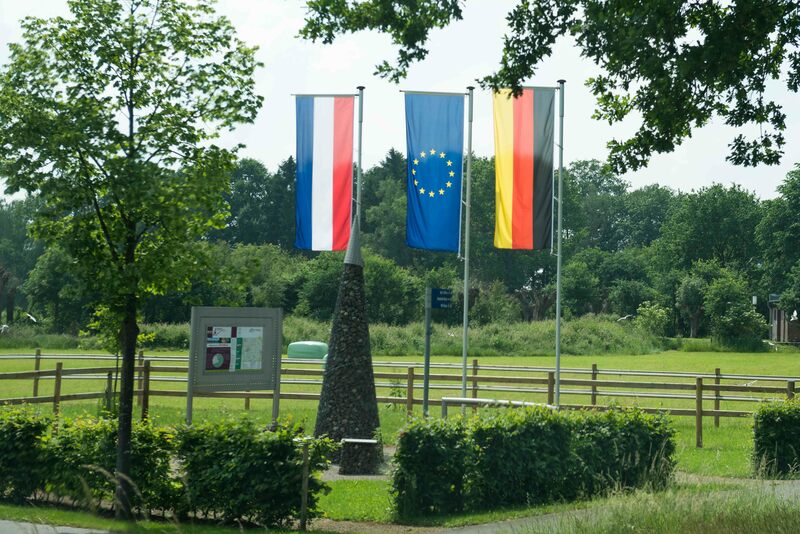 And a few kilometers up a gentle slope, through a panoramic landscape, we also found a representative of Einbeck, come to say thank you for the twelve Resista elms that had been planted there. Thereafter we set off together on an unplanned tour of the entire pedestrian zone of the town. Even though we’d been spoilt by the previous towns we’d visited on our route so far, Einbeck took things a step further. And despite being sorely tempted to spend the last day in May taking in the beauty of the area while taking in too something of the local Bock beer, which carries the name of the town – and which is famous, it must be said, beyond the regional borders too – we instead pressed on to Holzminden: a decision which, in light of the storm warnings for the following day which were now being broadcast on all channels, couldn’t have been better. 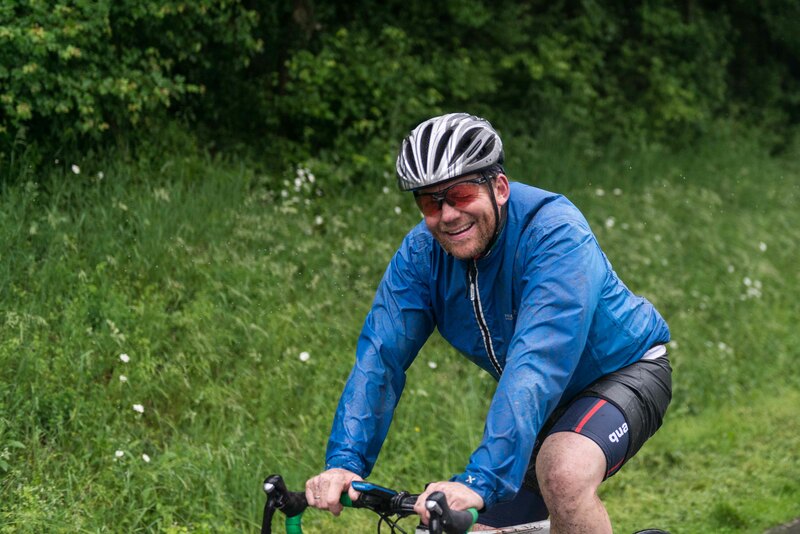 With only one more week of cycling ahead of us, our planned destination of London seems now, for the first time, to be in reach – despite the fact that there is still Westphalia, the Rhineland and three national borders to cross. Detmold – we’re coming! The fifth day was a day of surprises. 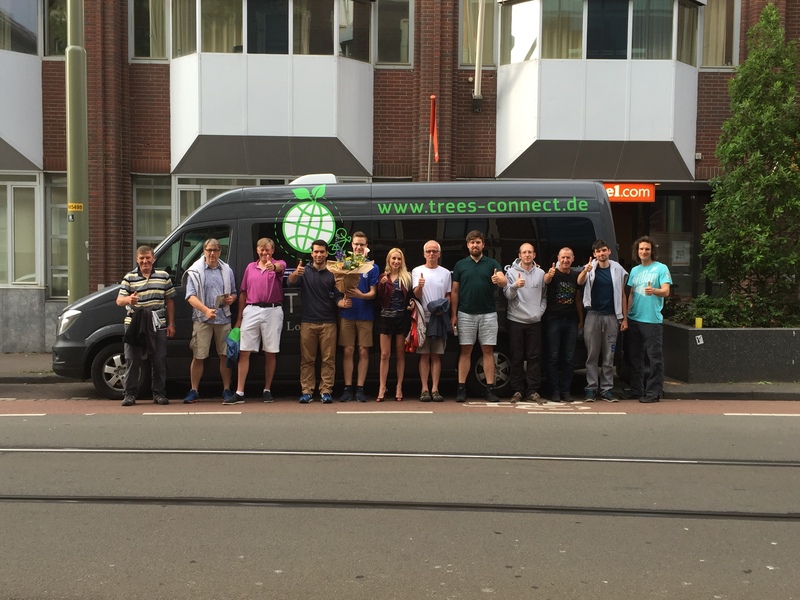 Not because in the Weser mountain region it began, for the first time on the 2016 Trees Connect Tour, to rain: but because in the end things are often not quite what they at first seem. And so it turned out that our host Hellen Kruges, who received us so warmly and who fed us so deliciously, turned out to be a photographer in disguise. And her studio, which we reached after a good number of uphills and downhills, then also turned out to be a photographic studio in the spirit of Helmut Newton. We were however allowed to keep our clothes on, and the peloton proceeded to follow the photographer’s instructions as never before on our tour. Many of the resulting photographs will I’m sure end up adorning one or other bedside tables. 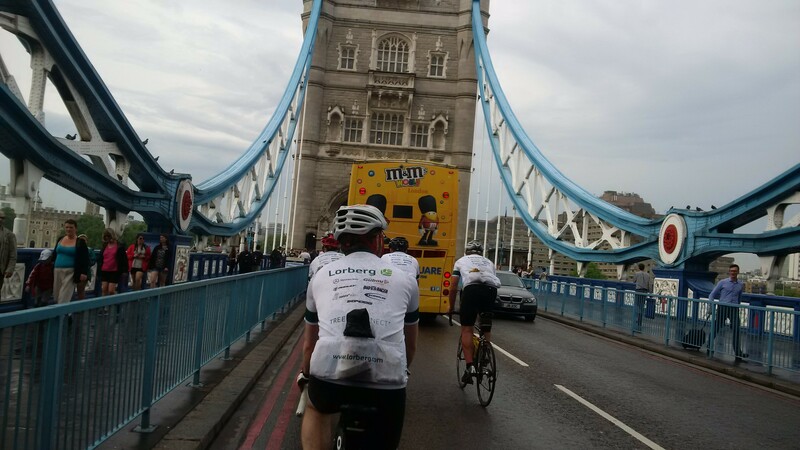 Delayed but not deterred, the cycle team set off once again to resume their original program for the day. 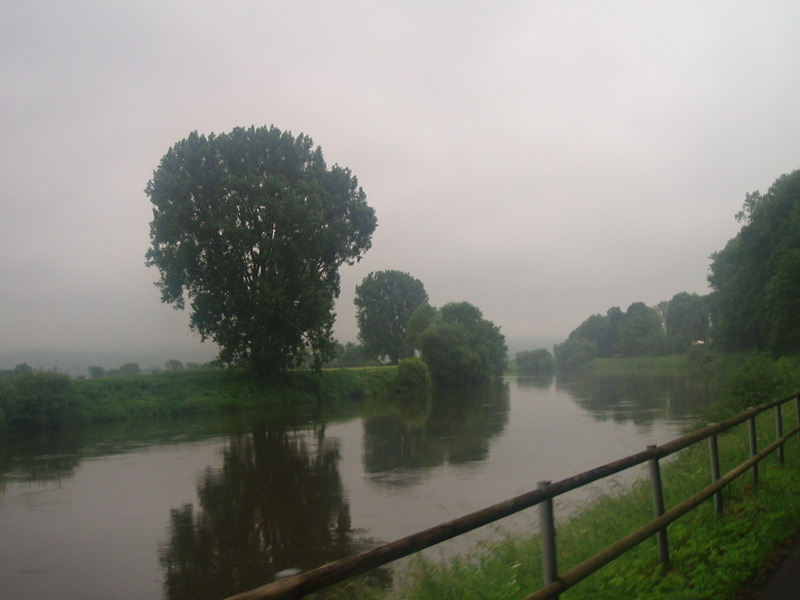 Somewhat later we reached the banks of the Weser near Holzminden, where the romance of the mist-hung meadows followed us for the next kilometres. 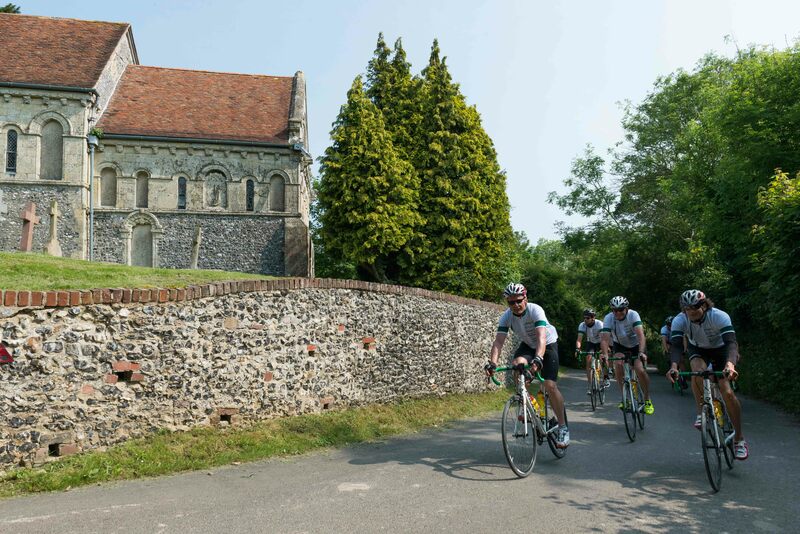 Heading inland, the peloton passed what had once been the Benedictine Abbey of Corvey, before the hill started once again becoming noticeably steeper. 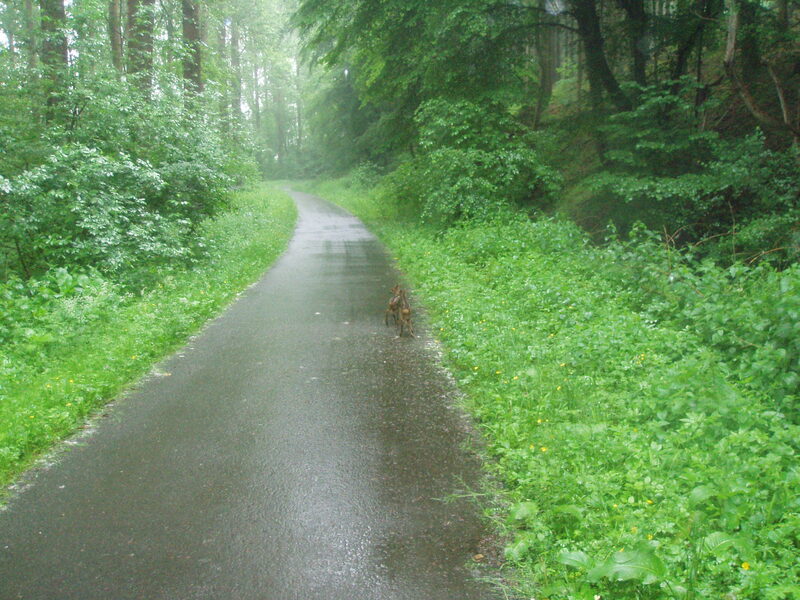 But now nothing and no one could stop the cycle team – at least not until we came suddenly upon two young deer standing in the middle of the European Cycle Path. Despite the rain and the wet street, the bold warriors managed to reign in their mounts, just in time to be able to stop and enjoy the spectacle. Whether the deer or the riders were the more surprised, it’s no longer possible to say. In what had now become pouring rain, we headed for the first appointment of the day. 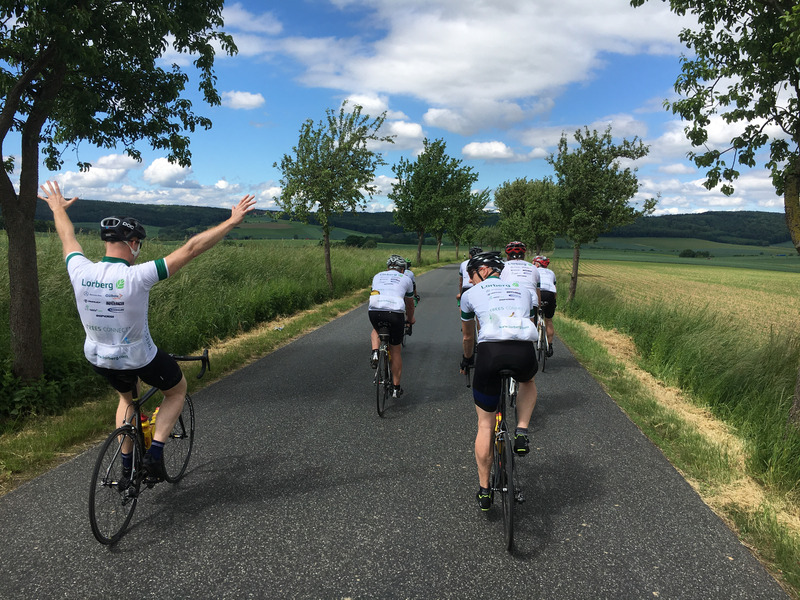 The representatives of the town of Nieheim were kindly waiting for the cycle team to arrive, and interviews and photo opps were concluded and the group was once again on its way in record time. 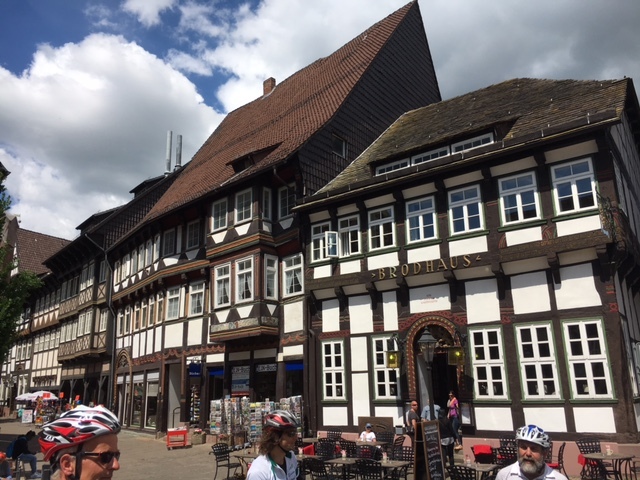 With no eye now for the sights around them, the cycle team reached Detmold in the early afternoon, accompanied now by Ralf Kleine, promoter of trade in the town of Steinheim. 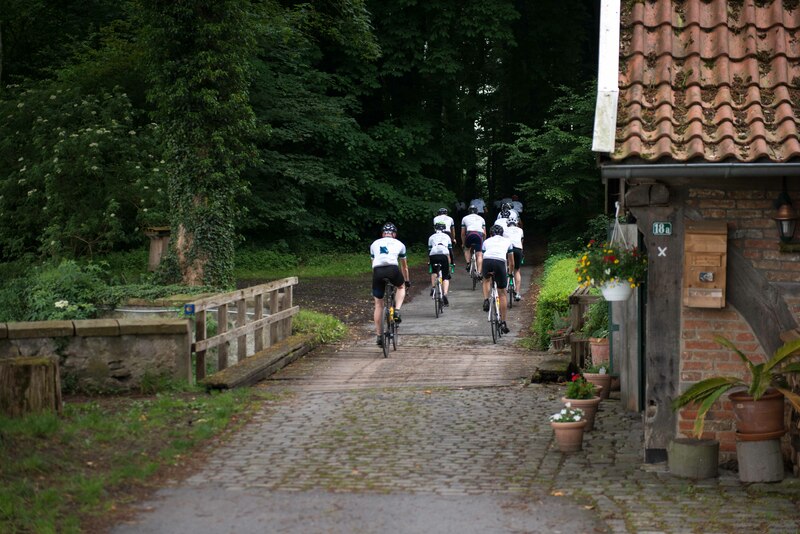 Despite the opulence of what was on offer at the Detmolder Lippischen Hof breakfast buffet, the cycle team leaders were merciless – which meant that the cyclists in their green-white Lorberg strips had to leave their buffet at an earlier hour than they otherwise might have done. 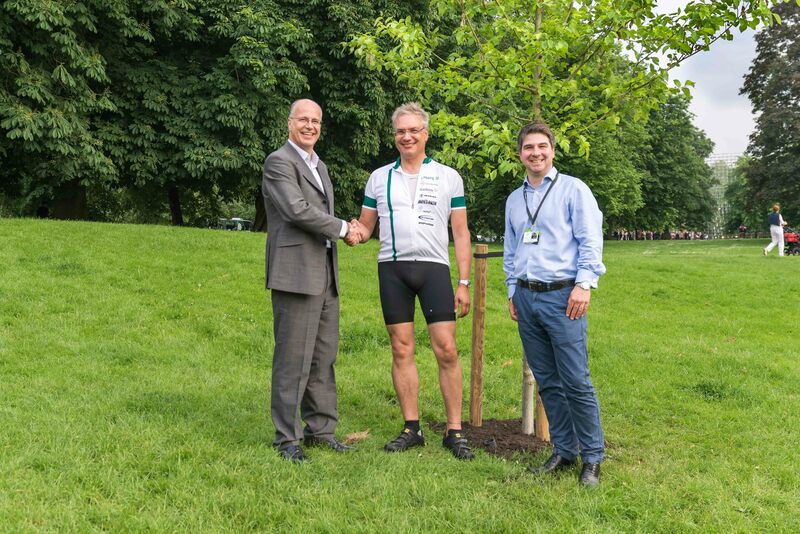 But no matter – they were rewarded with the lovely sight of the eight Resista elms which had been planted around the Holte Palace – as well as with the impressive media scrum which awaited the peloton at the moat ramp with original Teutoburger mineral water on hand. There was hardly a single local publication from the publication area of “Westfälische Rundschau” and “Allgemeine Zeitung” who hadn’t sent a representative. Thoroughly prepared, the local reporters left no stone unturned in finding out all about TERES CONNECT – so that we can’t help but be eager to read tomorrow’s morning papers! 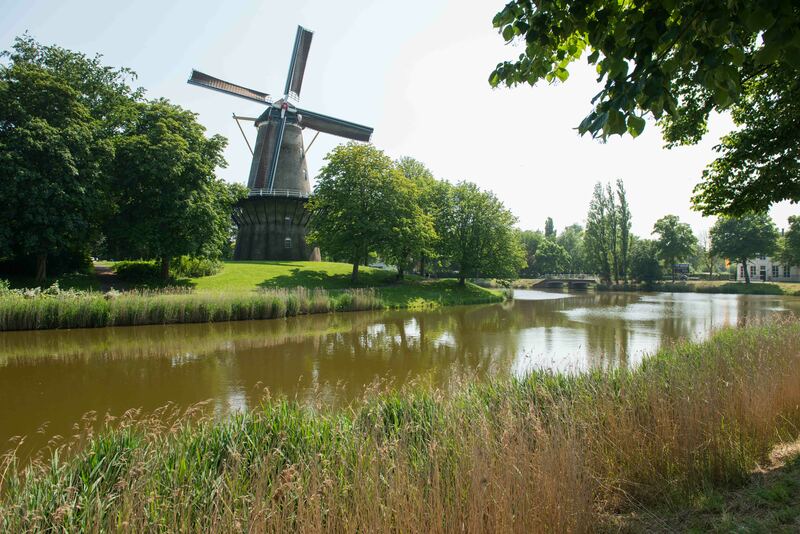 Coming from the idyllically located Palace Stute, attractively surrounded by elms, we were then soberly reminded, going through and around Guetersloh, that unfortunately not all of Germany is quite as visually stunning as we had had the pleasure to witness on our first five tour days. 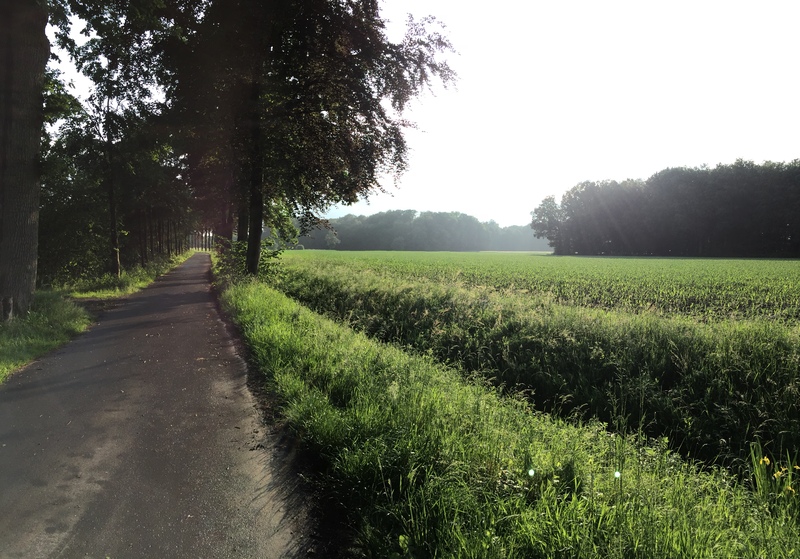 But to compensate for this impression, the land of Muenster then showed for the next kilometres just what it had to offer: as long as you don’t have an allergy to wheat silos, then the stretch between Guetersloh and Muenster could be just what you’re looking for. 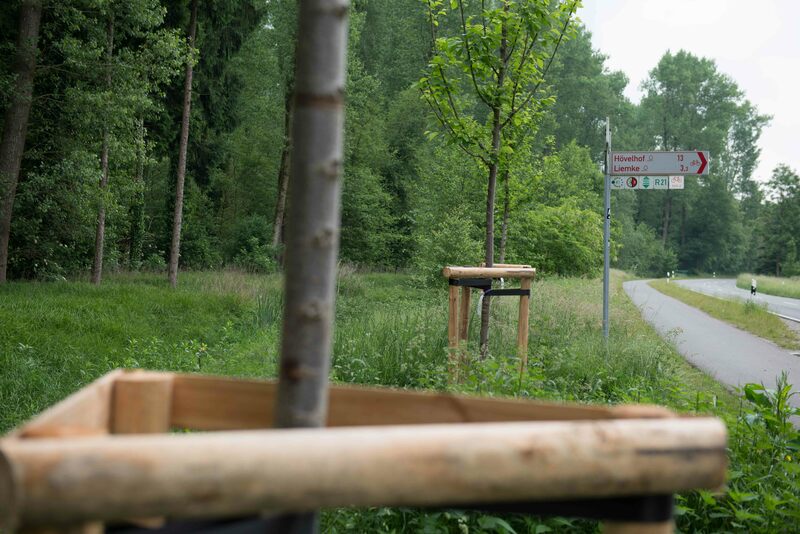 Very quickly – and in fact a little too quickly – we came to the city limits of Muenster; and we only just had the time to experience the ten Resista elms which had been sponsored by the local tyre producers there. One can only hope that these will enjoy a similarly long life as the tyres and inner tubes which had been provided to us by Schwalbe – up until this point not a single puncture has held up our journey. Once arrived at the Muenster town hall, we were greeted personally by mayor Markus Lewe. 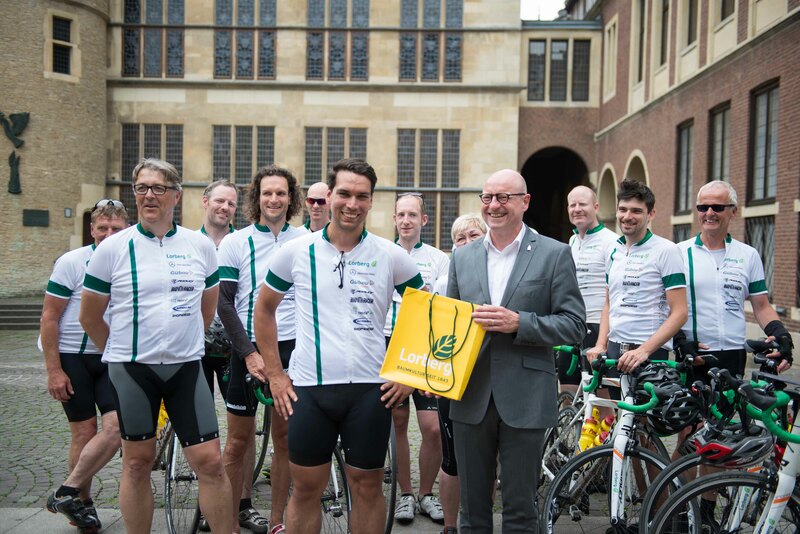 In his words of greeting he reminded the cycle team to make sure that they promoted the European idea on the last leg of their tour, from Dover to London. Then, with an eye on the dimming sky, he wished all the participants a good journey onwards. And his words had an effect – the heavy rain only set in once we had reached our Hotel. 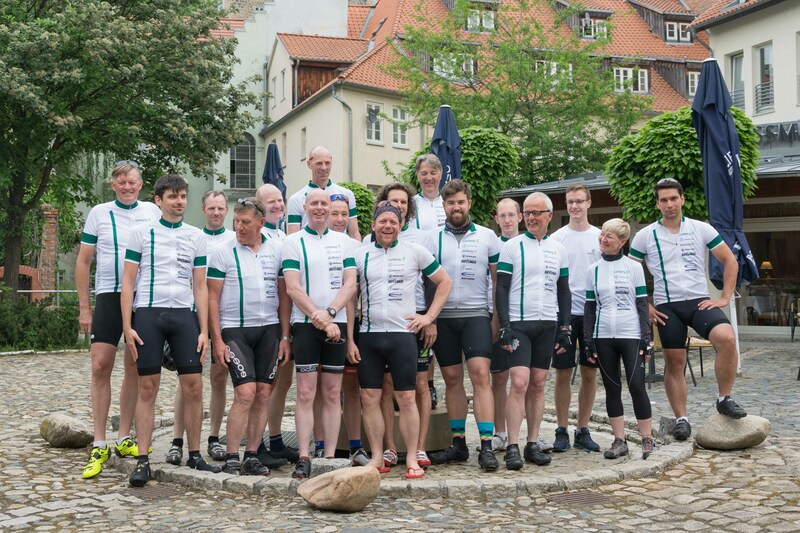 It was one of those evenings that should ideally never end, when the cyclists in their green-white Lorberg cycling strips celebrated finishing the seventh stage of the tour at the guesthouse of Birgitta Schulze Buschhoff. But in the end saying goodbye to Lorberg’s ambassador in North Rhine-Westphalia was unavoidable, regardless of the party and regardless of all the other excuses we could have come up with; since the seventh day would bring us to our first border crossing. Efforts to keep Europe together are currently experiencing something of a headwind. 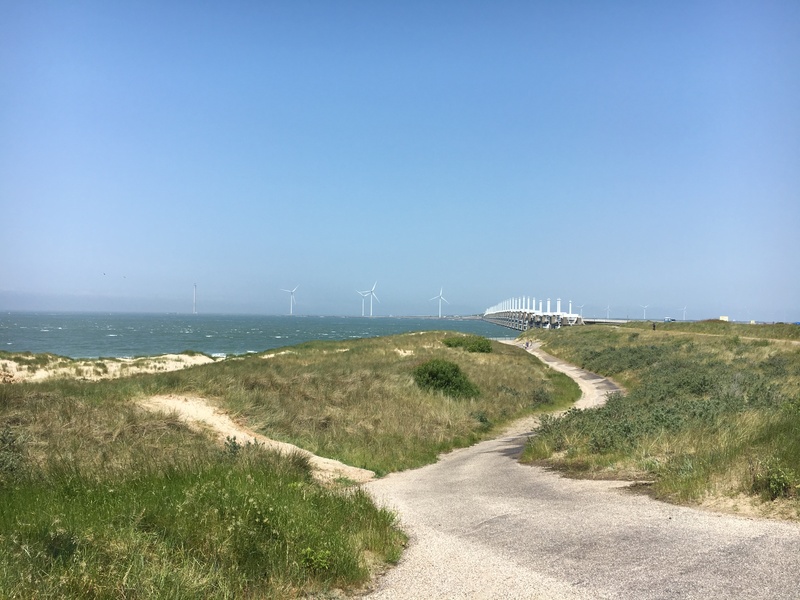 And on the European Cycle Path, we were experiencing another kind of headwind: against which it was also tough to keep going. Good, then, that there were eight more Resista elms coming up in Verden for us to visit. And the reception given us there by the representatives of the town was not only extremely welcoming, it also – very usefully – happened to take place at lunchtime. And shortly thereafter came the big moment, when we could look back to see the border we had just crossed. 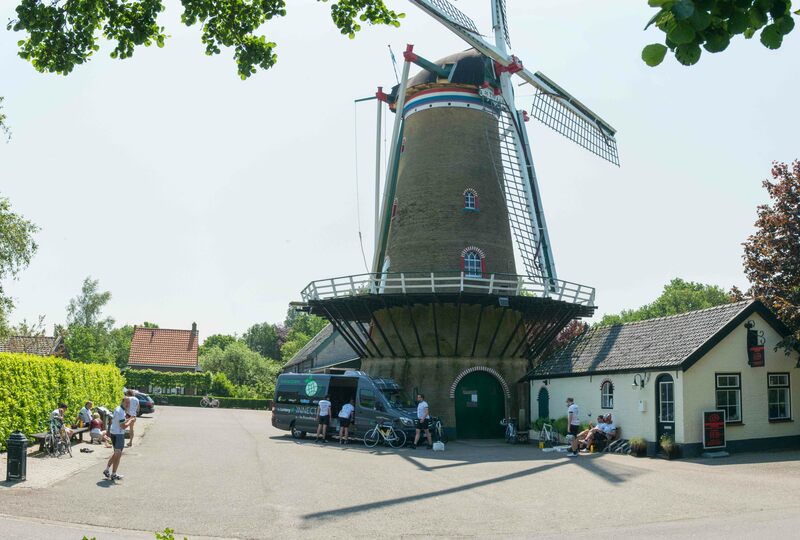 With the entry into Holland efforts at coordination became just that little bit more demanding; while cycling at speed along the long curving cycle ways, children, dogs and cones became obstacles to avoid, although I have to admit that the road surface definitely improved. Generally speaking, this last stage reminded us of the grandiose first days of Trees Connect 2016; in part because the predicted bad weather conditions once more failed to materialise. 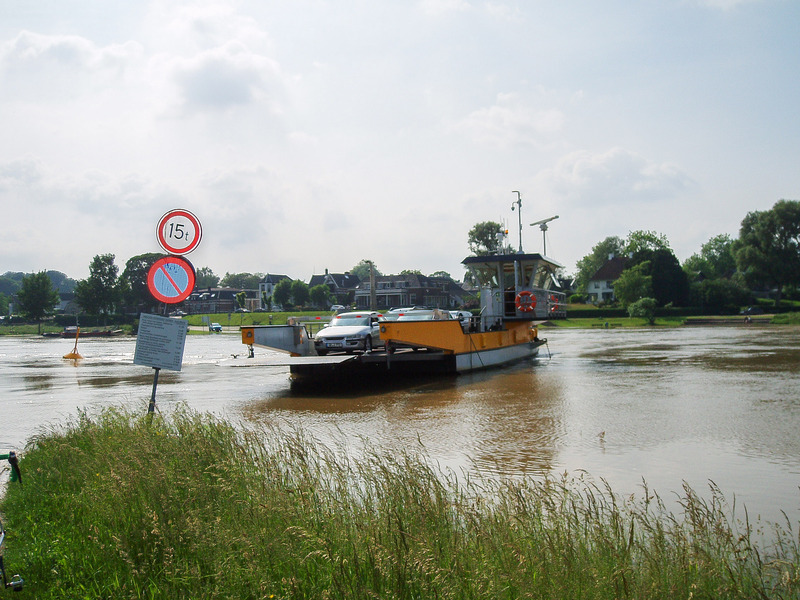 And the peloton in fact almost arrived in Arnhem in time for coffee and cake – if it hadn’t been for the Ijssel having burst its banks; and our having then to wait for a ferry to cross the swollen river between Brummen and Bronkhorst. 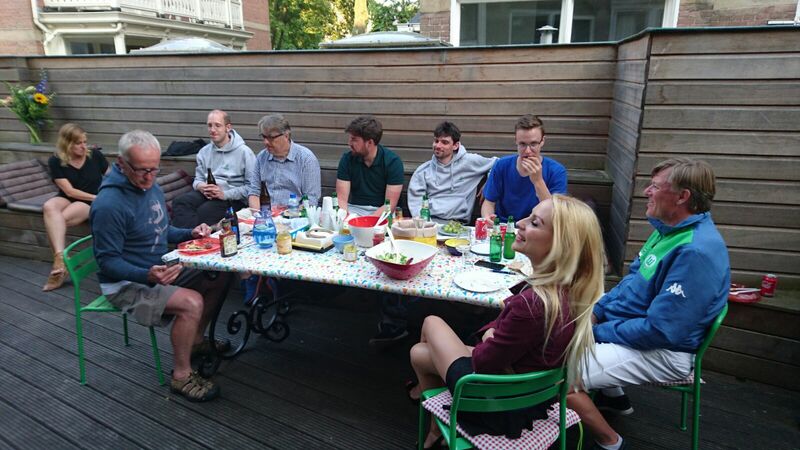 In the end we arrived in Arnhem just in time for dinner. The generosity of the portions in the Blauwe Hoek could have made it into the Guinness Book of Records, and for some of us, made up for the somewhat smaller size of the portions in the days before. Today after sixty kilometers of riding one of our number had a fall. The team regrets the earlier than planned departure of one of our strongest members. Many thanks for the extremely engaged support and for a great eight days. Get better soon! 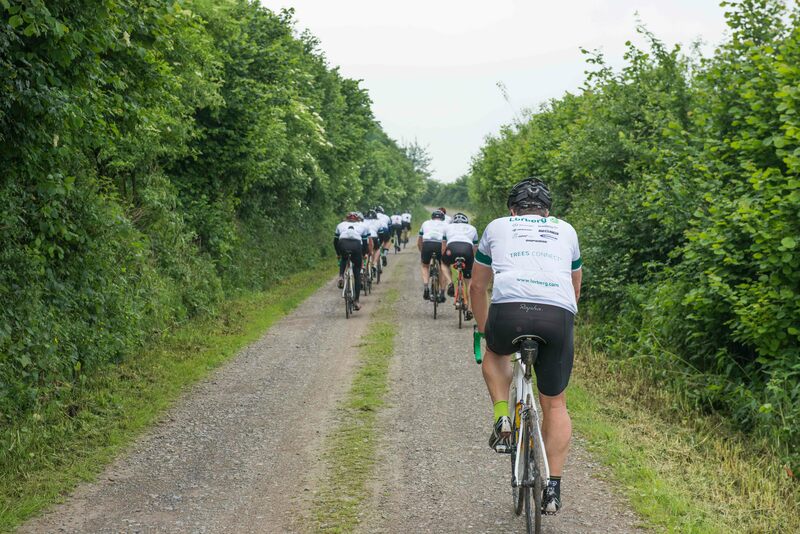 On the ninth day the cycle team in their green-white cycling strips crossed another border. 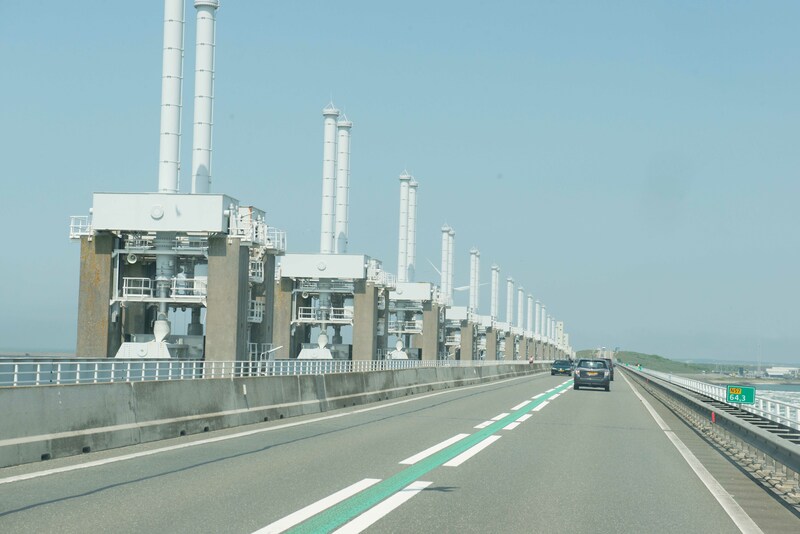 Somewhere between Sluis and Hoeke, along the Damse Vaart, we crossed the Holland-Belgium border without even noticing that we’d done so. 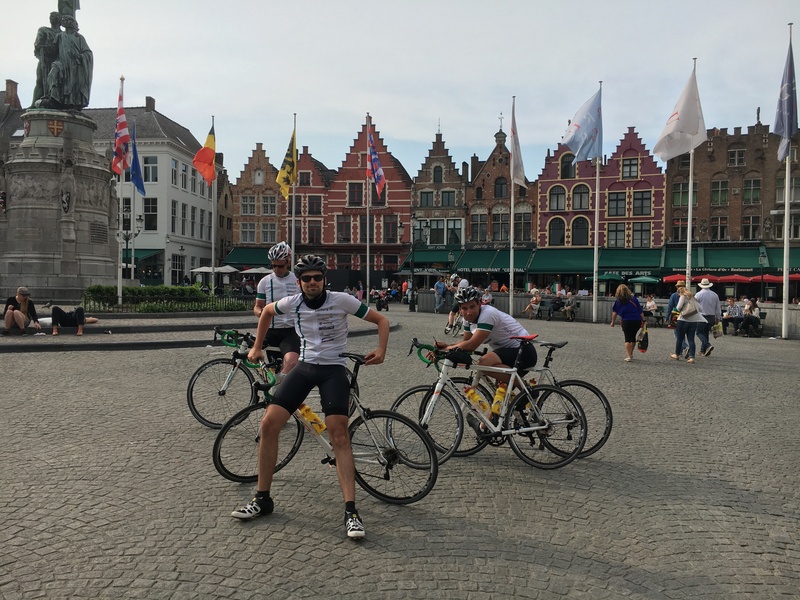 Once we were in the middle of Brugge, it was time to find out which of our multiple electronic devices with their various navigation software possibilities would win out in finding the best route. We didn’t however manage to find out which was the winner. The only thing that was obvious was that the good old-fashioned map wasn’t among the contenders. Still, in the end we had to accept that although the map would have given us a much more direct – and much less interesting – route, we would probably have missed out on an extremely fascinating odyssey. 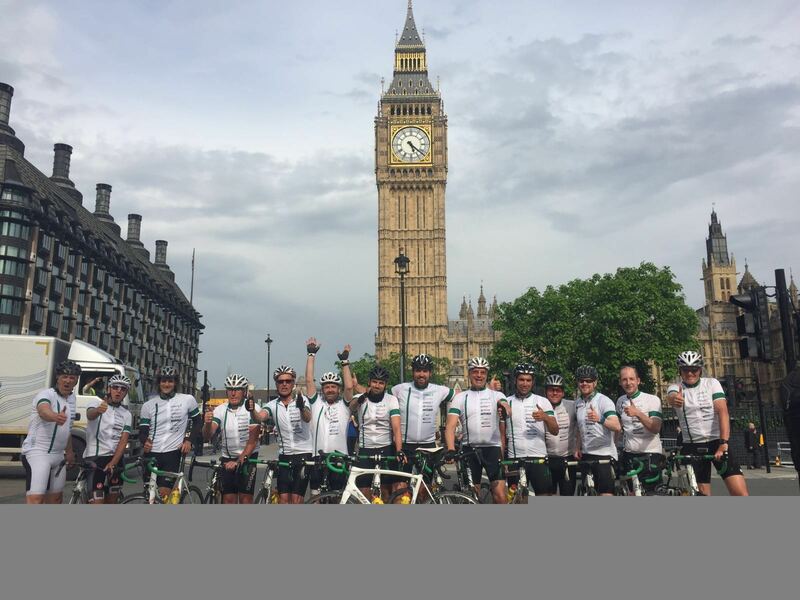 And the previous days had also given us their share of experiences – ones that sometimes no other cycle team could have had. One of the absolute highlights was the chance to ride at full tilt straight through the award-winning new building of the Arnhemer main train station – without, it must be noted, the line being closed. After the various somewhat unhappy experiences that we’d gone through, the evening that we spent at the end of the eighth day with Christina, Ines and Bernhardt in The Hague evened things up. 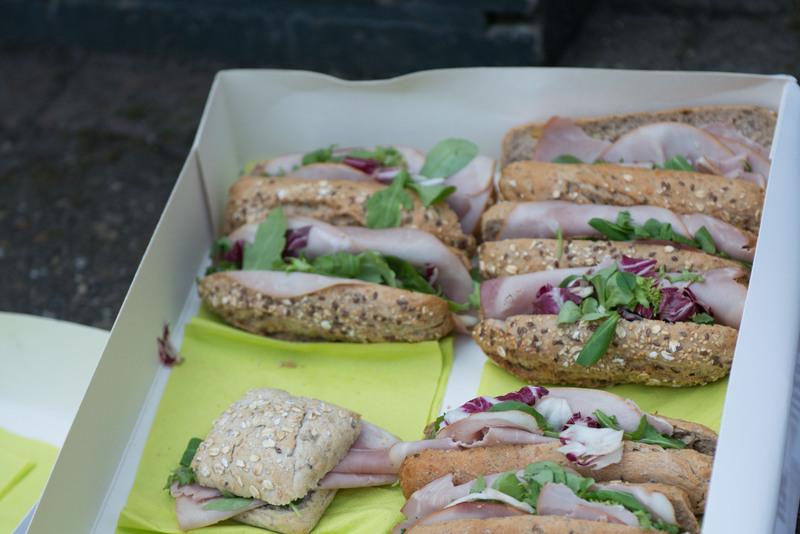 Not only the new organic butcher that Christina had discovered, but also the best apple cake in all of Holland, as well as the sauces, salads and drinks that were served could all be recommended without reservation. And of course the flowering of the German-Portuguese friendship! 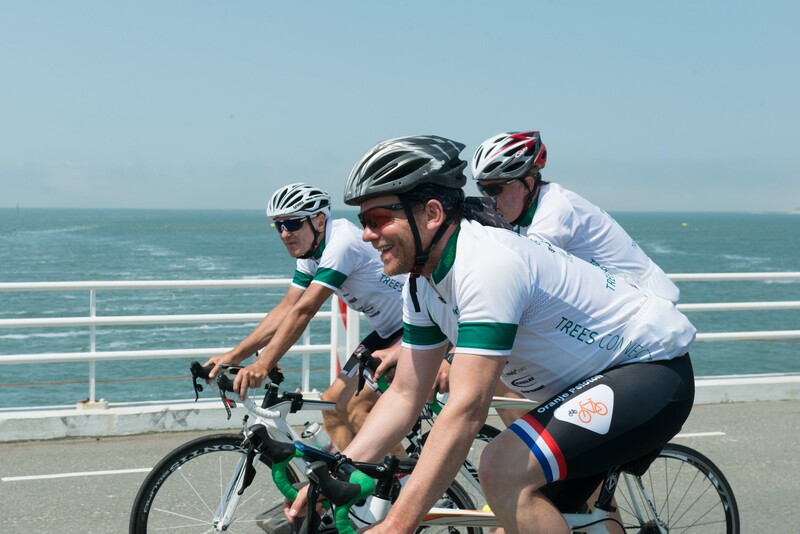 In this way, the cycle team could hardly have had a better start to the royal stage of the tour. And the weather was such that we got to enjoy all the things that make cycling such a pleasure: an array of impressions that you can only get if you travel by bicycle. 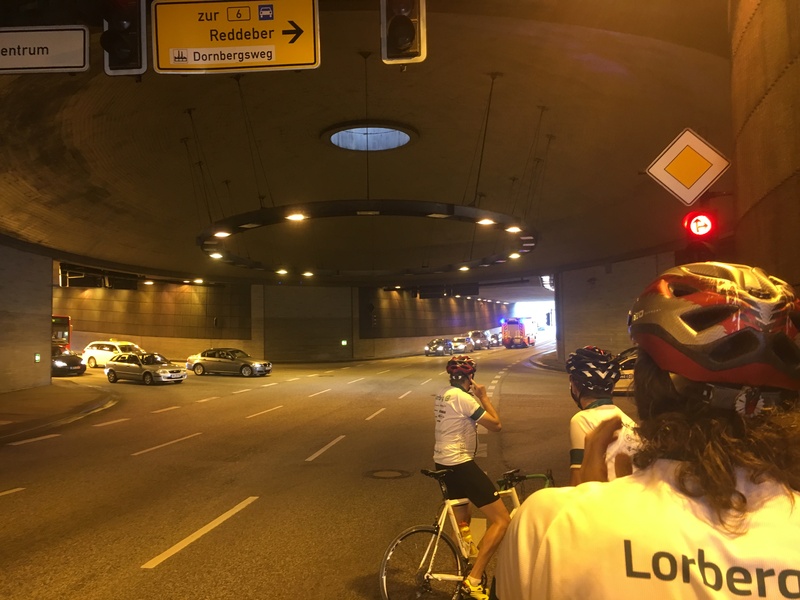 And when we had to take a lift with our bicycles in order to go through the Benelux tunnel, which crosses beneath the Niewe Maas, even the young Berliners in our number were impressed that something like that could exist. 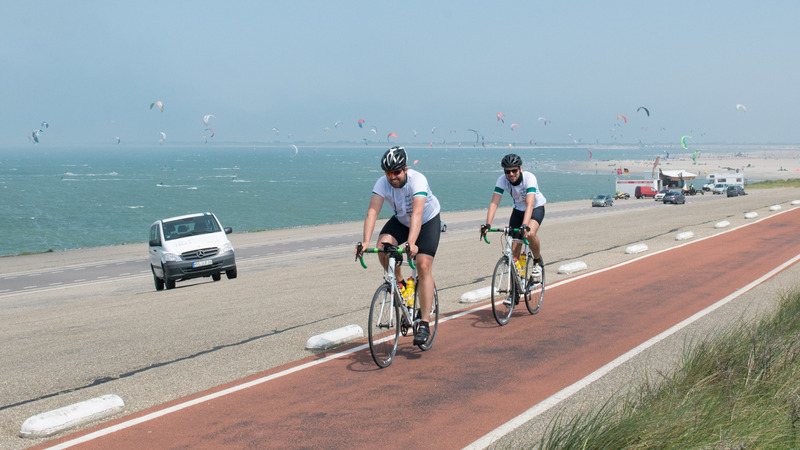 And so we went on with a strong tailwind through Zeeland, with its wonderful sandy beaches. 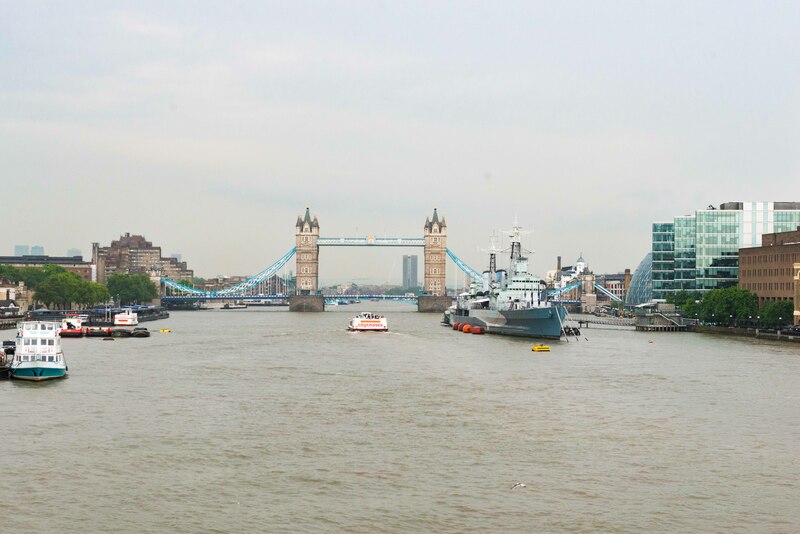 Although the colourful hustle and bustle could only be taken in from a distance, at least the route went past a number of pretty towns and other sights to see. 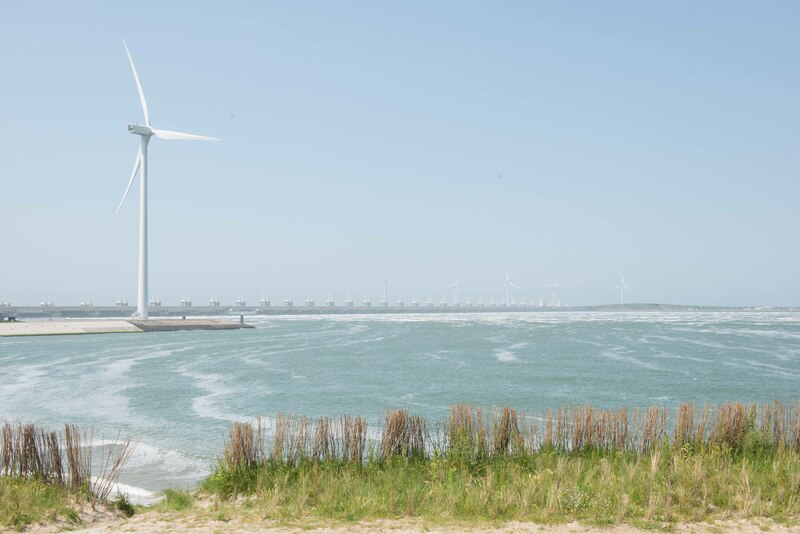 Over the storm drains of the Deltaworks, considered at least by the Dutch to be the eighth wonder of the world, we continued on to Vlissingen, where a boat was already waiting to take us across the water. And so the third-last day of the tour went by all too quickly. We were all looking forward to meeting our English colleagues, and hoped that tomorrow we would find another boat waiting in French Calais to take us across the channel to England, crossing borders to take us to our eventual destination at the end of the 11th day, in Kensington Park, getting closer all the time. 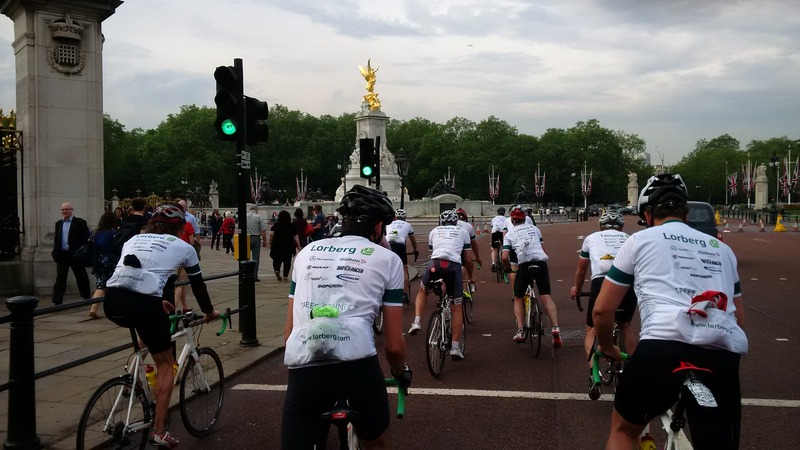 Even when it’s still too early, on the second-last day, to sum up the experiences of the tour, still there are a whole lot of people and things without which our riders in their white-green Lorberg cycling strips would never have reached their destination – be it from Calais to London or in fact any of the previous stages too. Right off the bat there’s Bilyan, Raoul and Julius in the two accompanying vehicles; as well as Nico, who, no matter where and in what conditions we were in, managed to produce films and photographs capable of winning prizes. Like trying to shoot a video from an underwater drone for example. And without Andrea Ullrich, we wouldn’t have found either places to eat or places to sleep; and without the Berlin branch of Mercedes-Benz there wouldn’t have been a sprinter to carry both luggage and wounded cycle warriors from one stop to the next. Without our Power Bars, our energy might not have lasted as long as it did; and without Schwalbe providing our tires and inner tubes we would have suffered a much greater number of punctures – which we saw when we were in the position of being able to directly compare the performance of these tires and inner tubes to those of their competitors. 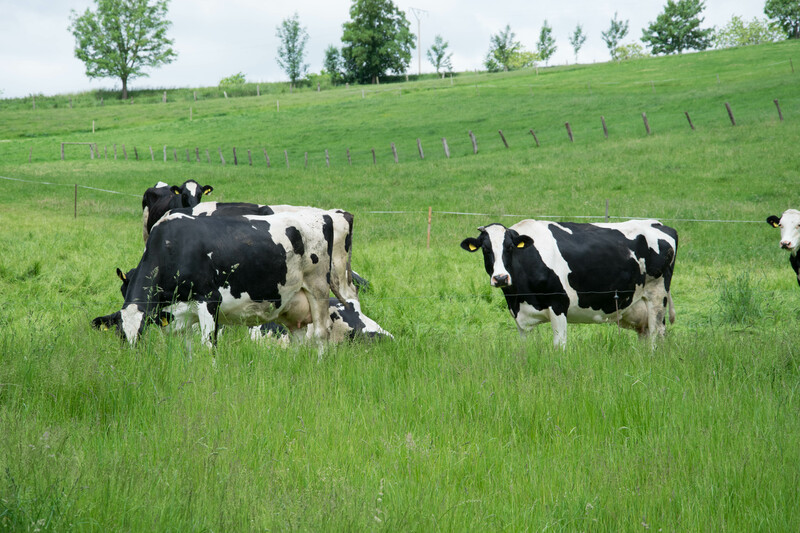 Without resista®, the patent holder of the elms we had planted, there would have been no elms to plant, and without Guebau they wouldn’t have arrived at the planting Locations. Bio Racer made the cycling strips possible, and last but not least Ridley and especially Carsten Niemann from shop4cross in Potsdam provided the bicycles which we used to do the tour. 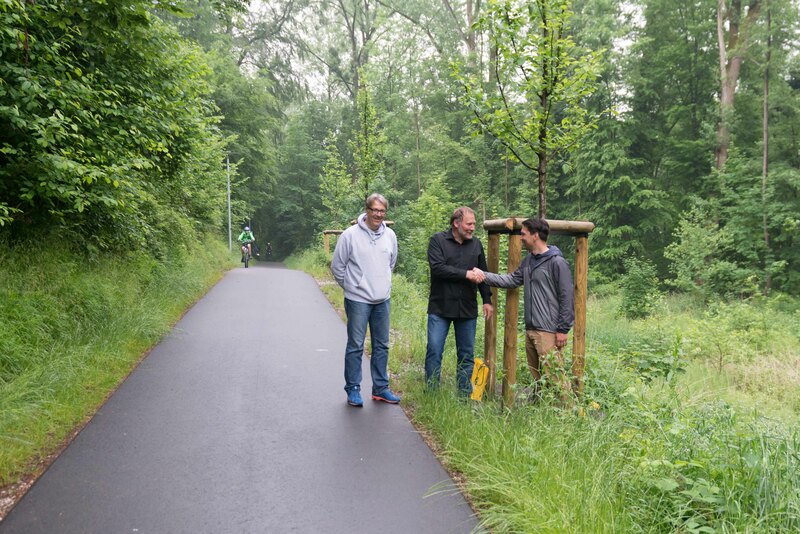 And of course thanks to Stefan and Daniel Lorberg, as well as Johannes Grothaus, who not only initiated this project – a project important in many ways, but also to take a stand against the present erosion of the spirit of Europe – but who also jumped onto bicycles themselves to take part in it. The second-last day had something of the character of a transfer stage, perhaps unsurprisingly. 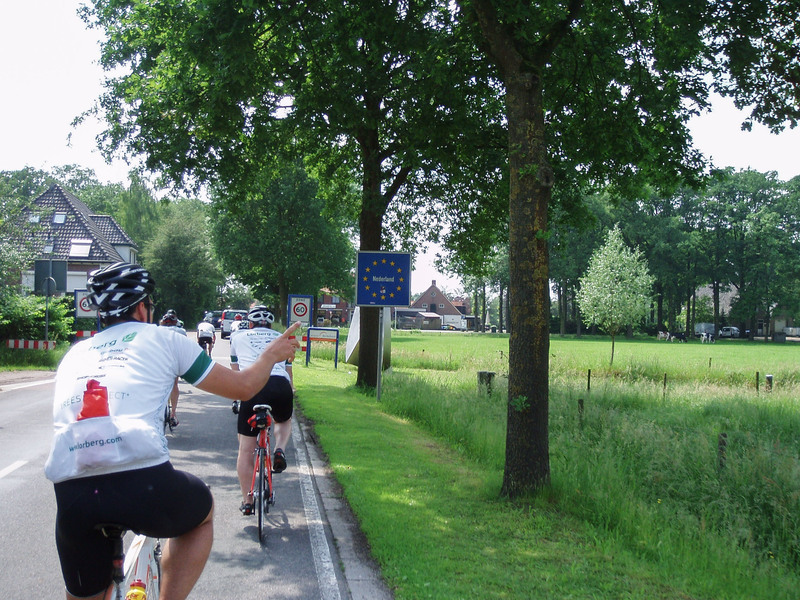 Not only because of the fact that, whereas in Belgium the villages seemed to merge one into the next without a break and as soon as we had crossed the border into France, the landscape became one of unceasing heavy industry: but also because, with the end goal so close, a number of the cyclists would have liked simply to have kept on going. 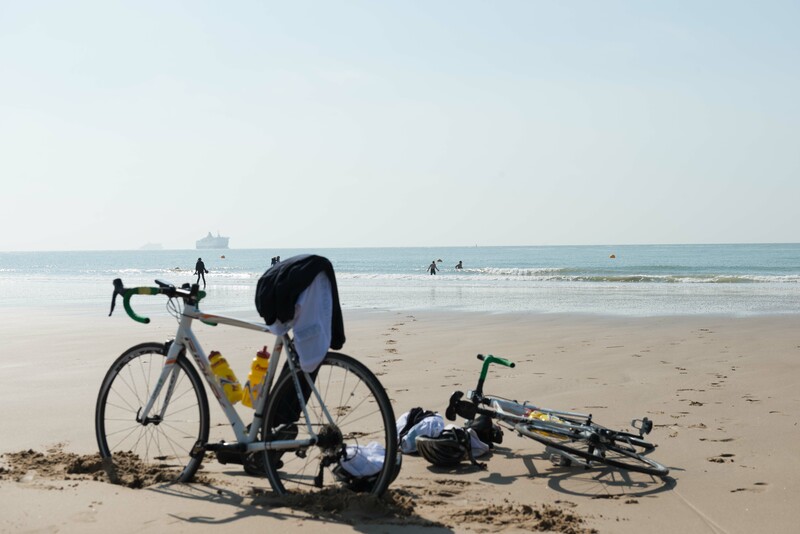 Thanks to the fact that our ferry didn’t leave until the evening, and that we had enjoyed a strong tailwind, we had the chance in Calais to find out just how warm the North Sea water was. 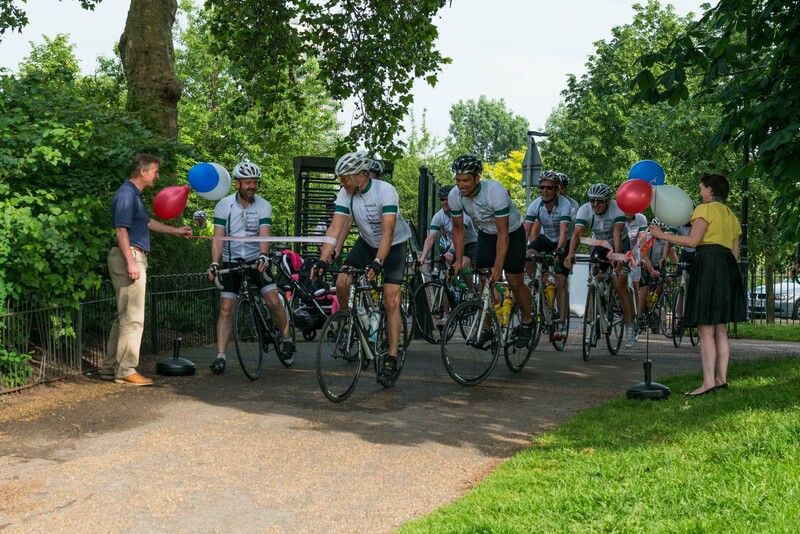 And since the ninth day of our ten-day tour woke us with sunshine – and the weather forecast means that things are looking just as good in London for our arrival – we’d like to invite you to come down and meet us at Kensington Park together with the Royal Park and Landscape Institute today (Tuesday 7th!) at 3.30pm. The meeting point is directly across from the memorial for Princess Diana – you can’t miss it. 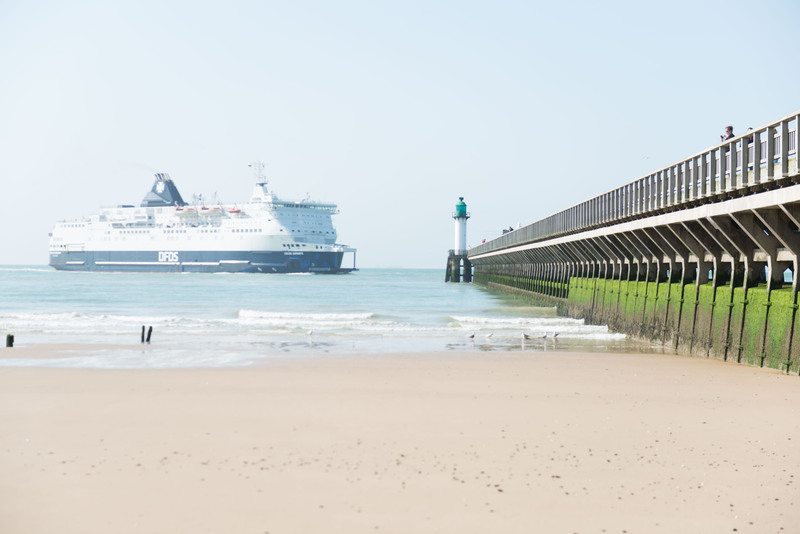 By the time the peloton reached Calais, after covering 1300 kilometres, there were only twelve riders left, around half of the team not having made it this far. But four colleagues from the UK joined us there, in order to travel to the final destination of Kensington Park together. The weather was good and even though driving on the left brought with it the odd surprise, still the final goal was reached and the joy in getting there was overwhelming for everyone involved. It can only be hoped that the commitment to Europe that came up in the welcoming speech, and that lay at the heart of the entire Trees Connect idea, can help to overcome the British scepticism regarding Europe. And of course we don’t want to stop now – after the often bumpy road through Europe, after the hundreds of elms which had been planted along the way, we hope that the whole thing will serve as inspiration to keep the idea continuing and growing in the next years! 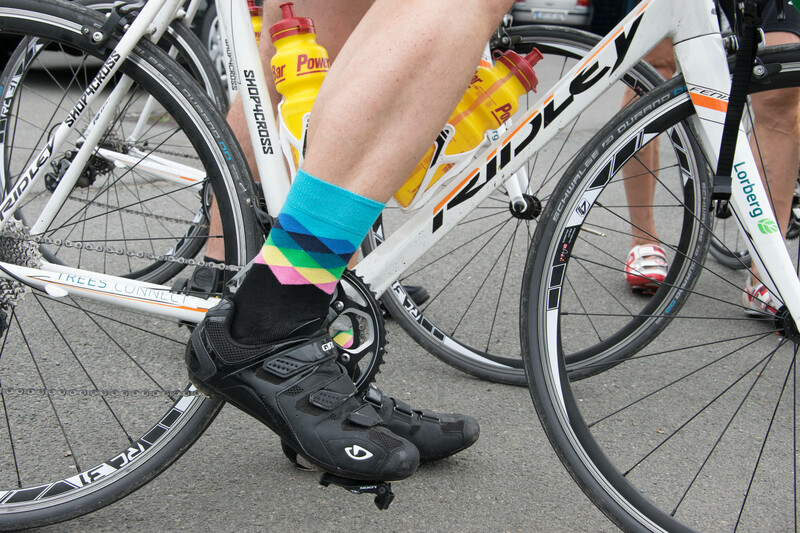 Check out our daily posts including the latest news, pictures and anecdotes of our ride. Ready, set, go! Finally we set out to St. Petersburg, first stop: Sulecin/ Poland. 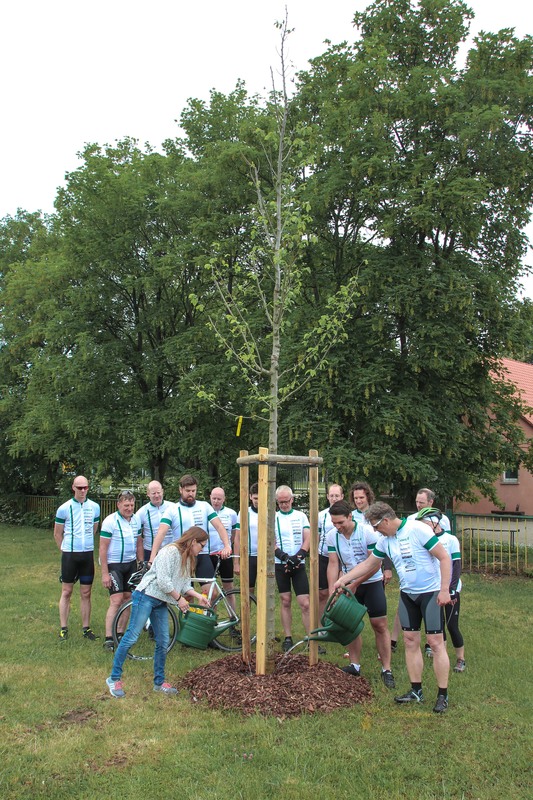 But first we had to pass through Berlin, on bike, the day of the German Soccer Cup Final… After leaving the capital behind us, we passed through Waldsieversdorf, where only two days earlier on May 29th, one of the last Resista-Elms was planted in the course of the Trees-Connect project. The rest of the day passed without major incidents. That is, until we reached the border. It was raining cats and dogs in Poland, no shoe nor shirt remained dry. However, after seven long hours on bike we finally reached our destination. And for the rain, our enthusiasm for this tour could not be washed away so easily. Today’s biggest hurdle was without doubt an 8 km long stretch of sand between Sulecin and Pila. It required all of our concentration and attention, especially while laughing about the zigzag lines driven by our mates. Speaking of which, three of our team members headed back to Berlin today, as for most people tomorrow will be just another day at work. For us however, it will be 218 km on bike, Grudziadz here we come! Day three is the hardest they say, as the body is longing for some rest. But that was not an option for us. 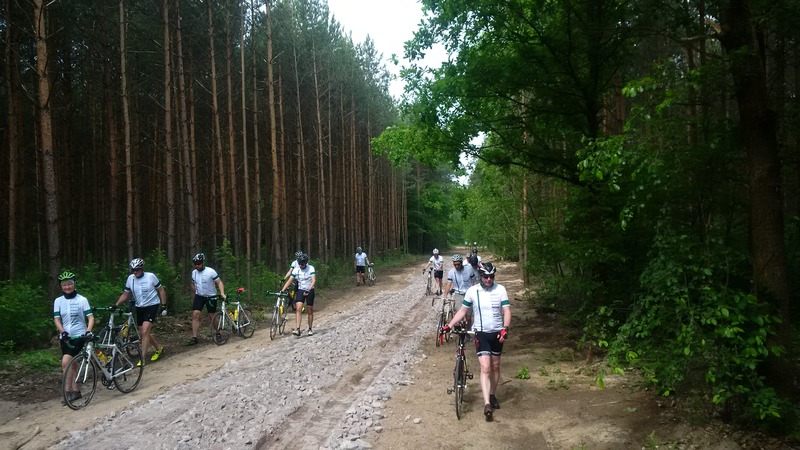 We continued our ride to Grudziadz with tailwinds helping us pass quite a number of slopes and elevations. On the last stretch the wind was blowing right at us, but thanks to the savoury polish cuisine, we managed to pull through and reach our last destination in Poland. 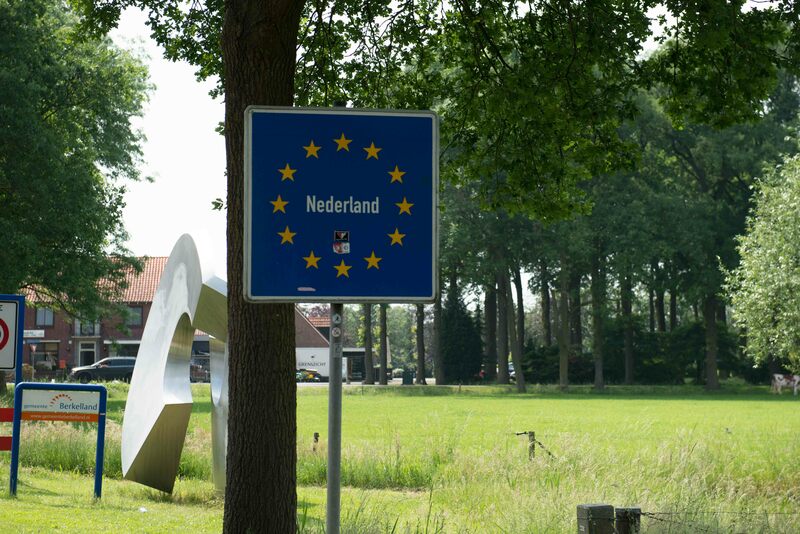 Another country border is waiting for us to be crossed tomorrow, we can’t wait! What a day! The serpentines leading to Frombork were by far the harshest obstacle to overcome on this tour. Within a distance of only 15 km we covered a 100 m difference in altitude and the headwinds weren’t really helping either. But to every up there’s a down and quite a down that was! With speads up to 60 km/h we cruised downhill, savoring every meter. In Frombork we took a little time out for a picture by the sea. 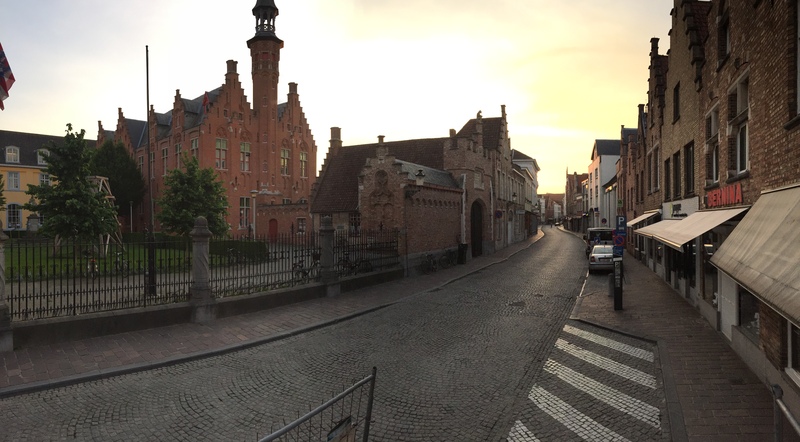 Just the perfect little town to farewell the second country on this ride. 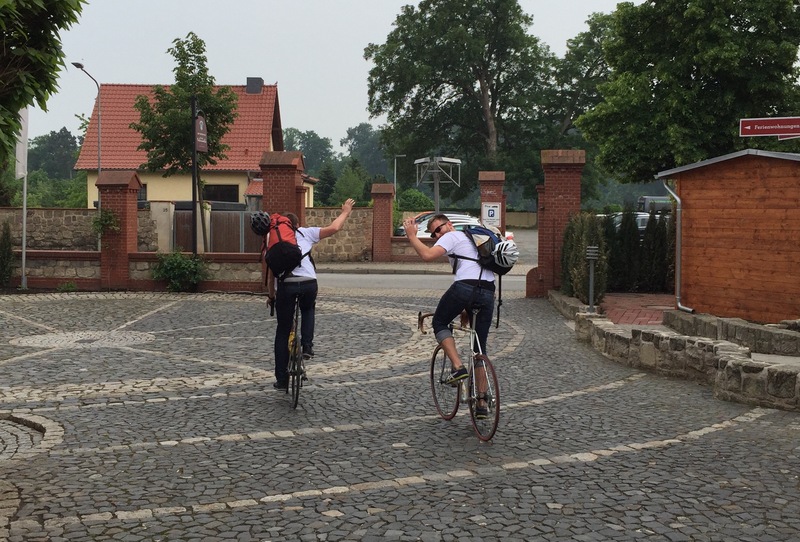 Thank you Poland, it’s been a pleasure meeting you this way, who would have ever thought we would cross through by bike? Yes, we had to tackle quite some challenges, but we rose up to the occasion and feel ready to conquer what lies ahead. 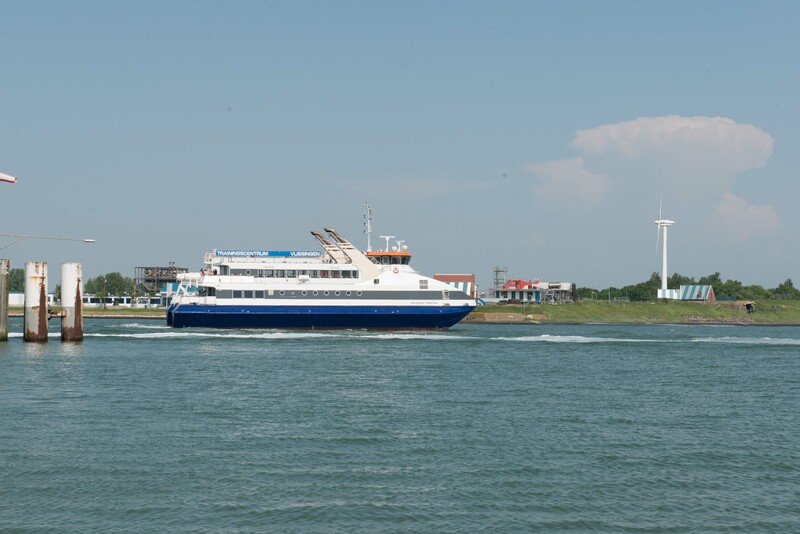 The first challenge was crossing the border to Kaliningrad. After a long 2,5 hr wait we continued our ride and reached the longed for hotel right by the river Pregel. Good evening Kaliningrad, we will see more of you tomorrow. Fun fact: Kaliningrad is a city for cars, not bikes. So instead of maneuvering our way around the car packed roads, we decided to put the bikes down for a day. Together with city representatives and the mayor Alexander Yaroshuk we planted one out of 18 resista-elms in Kaliningrad. We hope that the bonds created by these 200 trees will grow just as strong as the elm tree itself. Leaving Kaliningrad after just one day was not easy. 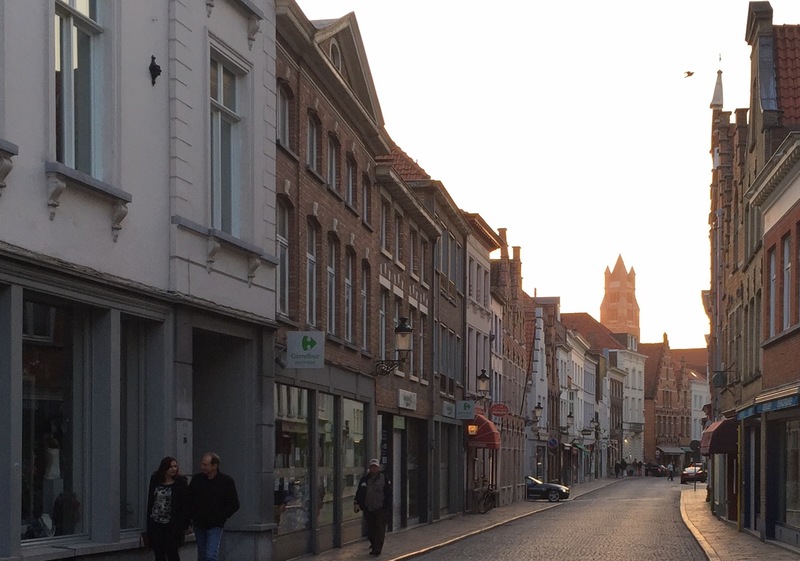 We would have liked to stay a little while longer to get to know more of the city and its people. 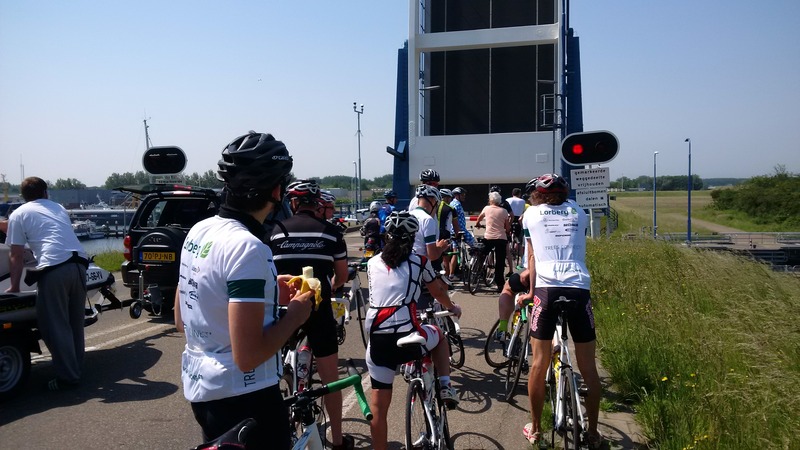 We started our ride to Riga with three riders, soon to be four as we met Remars at the Latvian border. 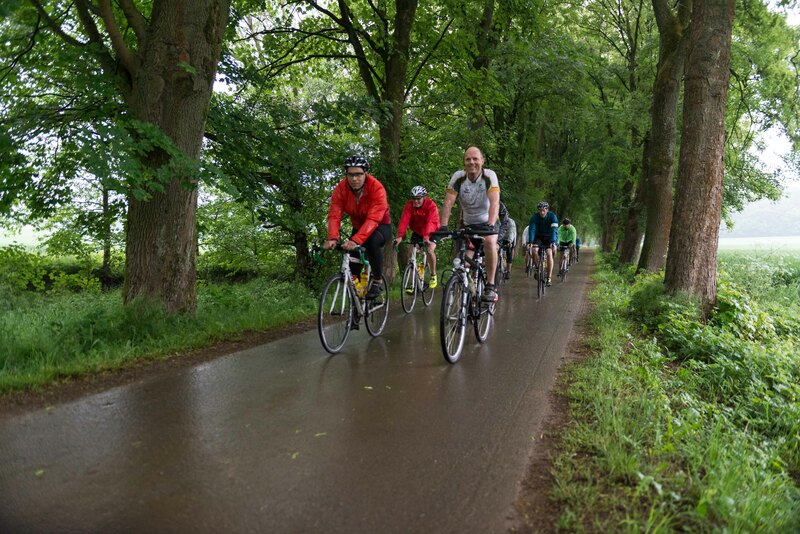 As a member of the velocouriers he guided us through Latvia for some time. After a filling lunch we said goodbye to our new friend and continued on our own. Beautiful landscapes and challenging roads passed on our way to Kuldiga where live music, dinner and our Resista Elms were waiting for us. Thank you for this very warm welcome! 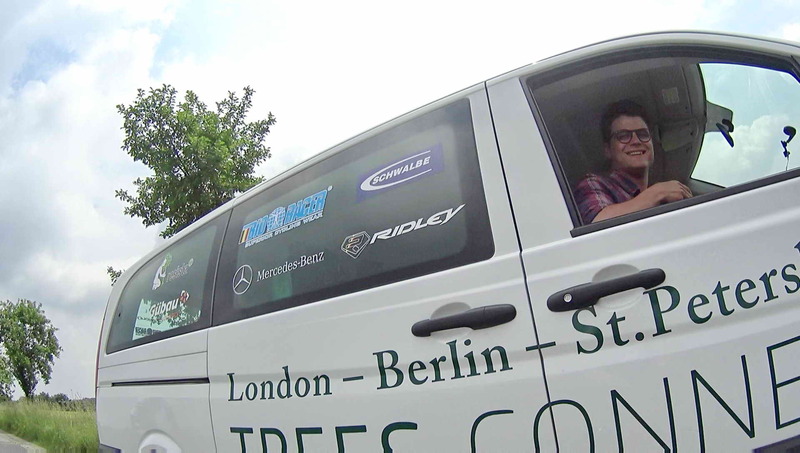 Before we hit the road, regional newspaper and television interviewed us, keen to find out more about TREES-CONNECT. 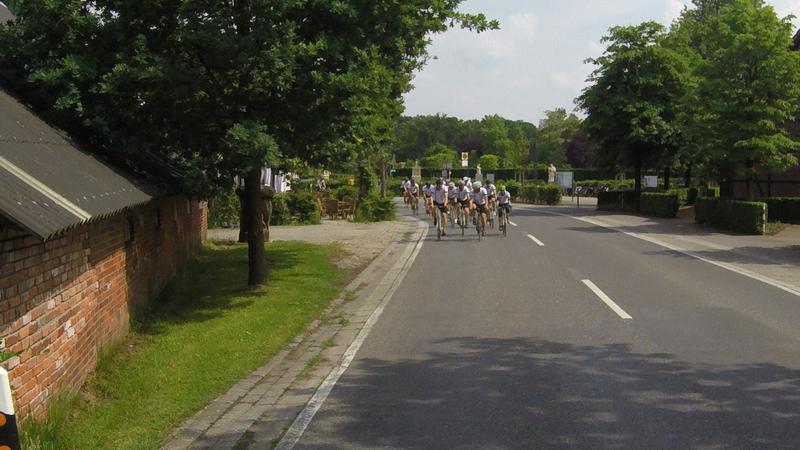 Kuldingas local cycling club met us by the Elm trees and we set out for Riga with ten riders. 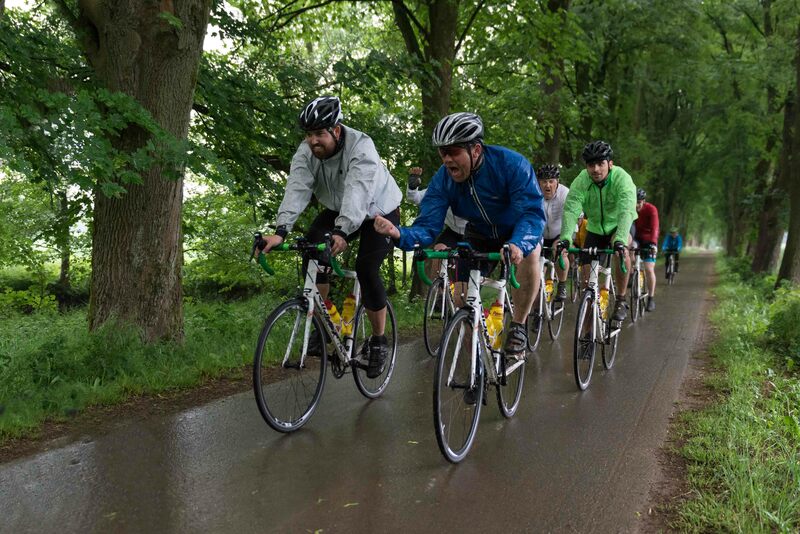 We enjoyed the company and got to know some of Kulingas cyclists – which turns out are some of the best in Latvia. Thanks for the support guys !! Having reached Riga in the evening Maris Jonovs, a local cycling messenger, took us out to find some local food. We got to see about 150 cyclists meeting for a nightride through the city of Riga! The next morning was a pleasant surprise as Maris and his friends awaited us at the hotel along with Vairis Jankovskis from our partners KIKSI in Latvia. 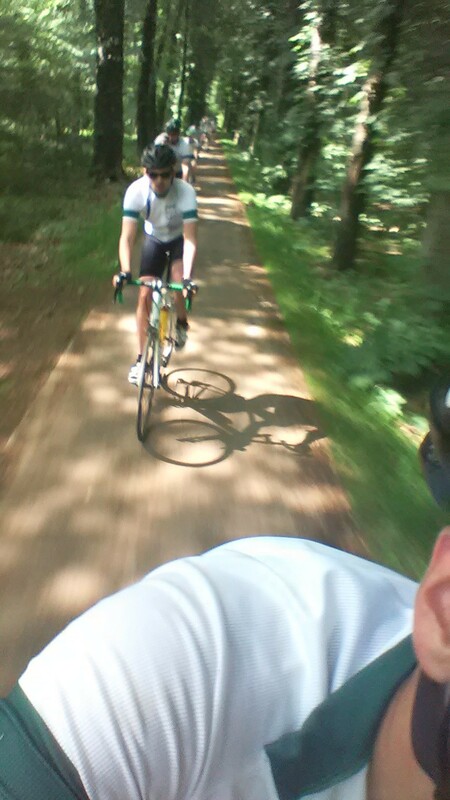 Together we cycled towards Sigulda on the highway, riding with an average speed of 35km/h. After 52km we reached Sigulda ahead of schedule and went for a ride with the local Kids, took a picture by the Elms and met for lunch in the KIKSIS head office. 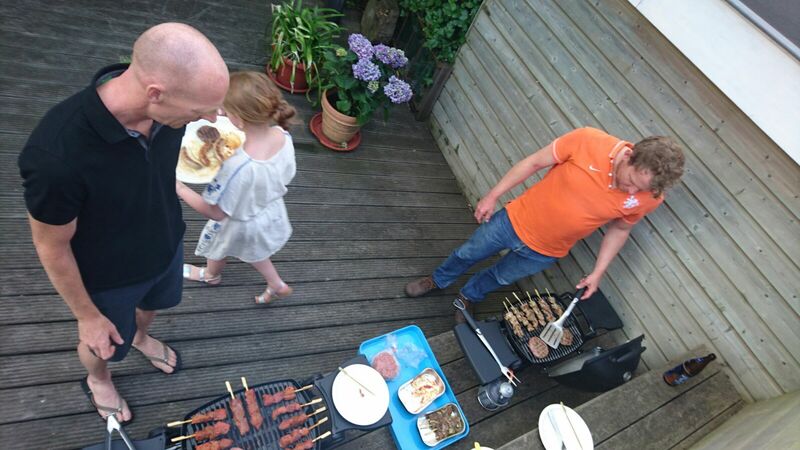 Thank you for the great food! 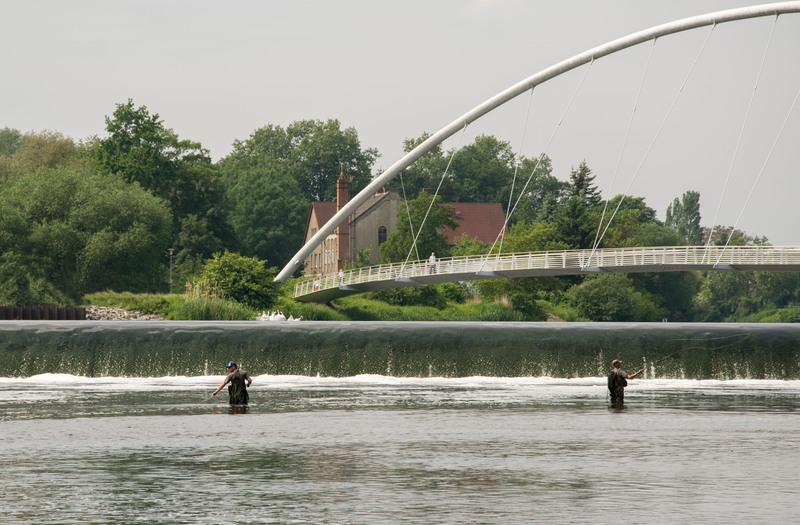 After lunch some riders headed back to Riga, others went to their home town. Viesulis (tornado) accompanied us to Valga. 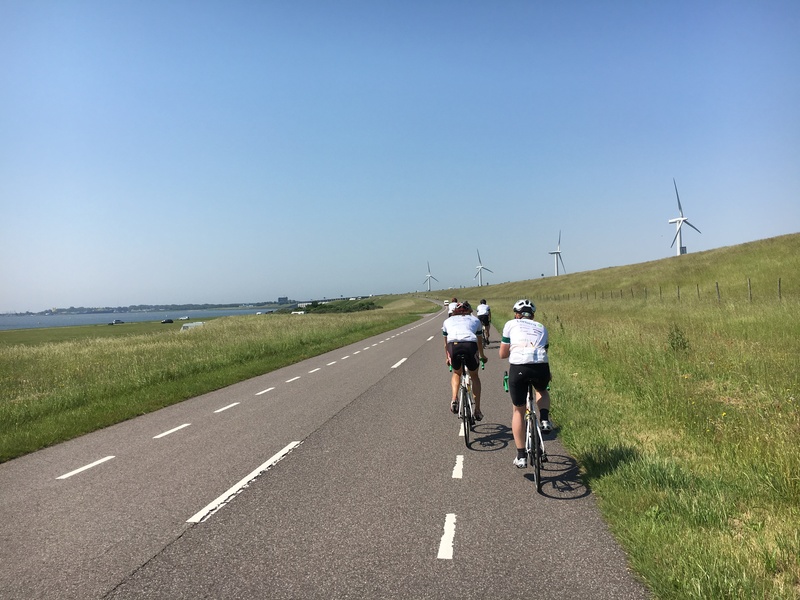 After 184km (Maris and his friends showed us a shortcut) and an average speed of 26km/h we said godbey to Viesulis – who rode all the way back to Riga that same evening. In the morning we met with Anne Vaigre from the city council of Valga, together we had a look at the Resista Elms. They made a good impression and fit in well with the park which can be crossed by bike using the R1. After a group photo we cycled towards Räpina, where we met mayor Teet Helm. He kindly guided us through his city ending the tour at yet another Resista Elm location. They are planted nicely along the R1 leading out of the city and it was an honor visiting the site with the mayor on a Sunday afternoon! From the shores of the Pskov Lake we can already see Russia, and as we leave for Tartu we wonder how long it will take us to cross the border tomorrow. We did it! After meeting the mayor of Tartu in the morning, we managed to cross the border to Russia late this evening where our Russian friends were already waiting for us. Dinner at the local fish restaurant was just what we needed after the long waiting period. Everyone within the group is cheerful as we only have 170 km left till we reach St.Petersburg. Peterhof here we are! Who would have thought that we were really going to make it within twelve days?! In the morning we visited the Resista Elms planted in Iwangorod, they looked healthy and were well arranged! We soon rode north encountering heavy head winds! Heavy gusts forcing us to hold our bikes straight while going downhill at 65 km/h, having to watch out for potholes that appeared as fast as they sped by! We couldn’t help but notice that race bikes were not the perfect choice for the second half of todays ride, still we made it to Peterhof without any breakdowns. Happiness overcame us as we cruised down the last hill towards Peterhof, knowing that the longest, hardest part of the TREES CONNECT tour was almost completed! Eager to see what tomorrow will bring we will fall asleep tonight, wondering if we will actually meet 200 cyclist riding the remaining 35 to St.Petersburg! We made it to St.Petersburg! 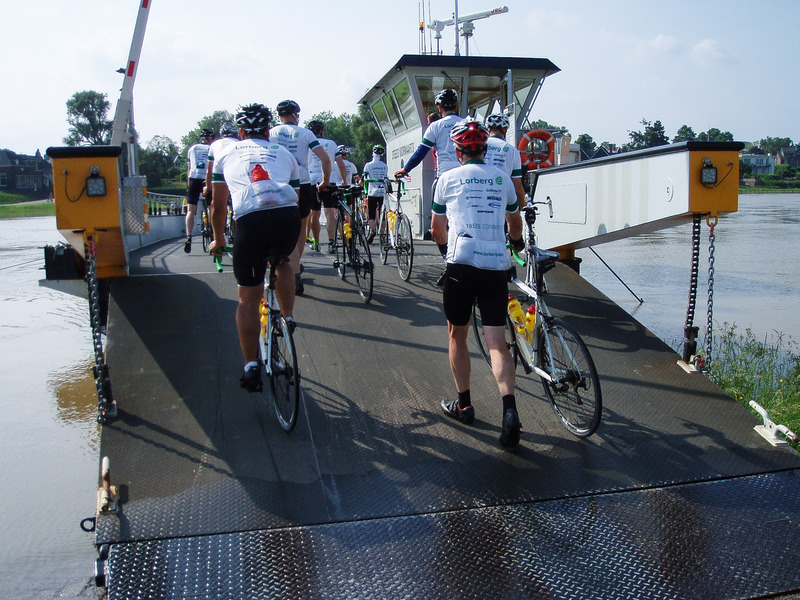 Together with up to 400 cyclists we were escorted all the way to St.Petersburg! It was simply an overwhelming experience to make it on time for the 52. IFLA Congress. Stefan Lorberg delivered the IFLA Flag to the Governor and the Opening Ceremony took its course. It was a beautifull day, a warm welcome and tommorrow the last Resista Elms will be Planted in St.Petersburg along with two Lorberg Oaks!